After Berlin we took a little 4-hour train trip west and then north to Kiel, where Anke works and spends much of her time. 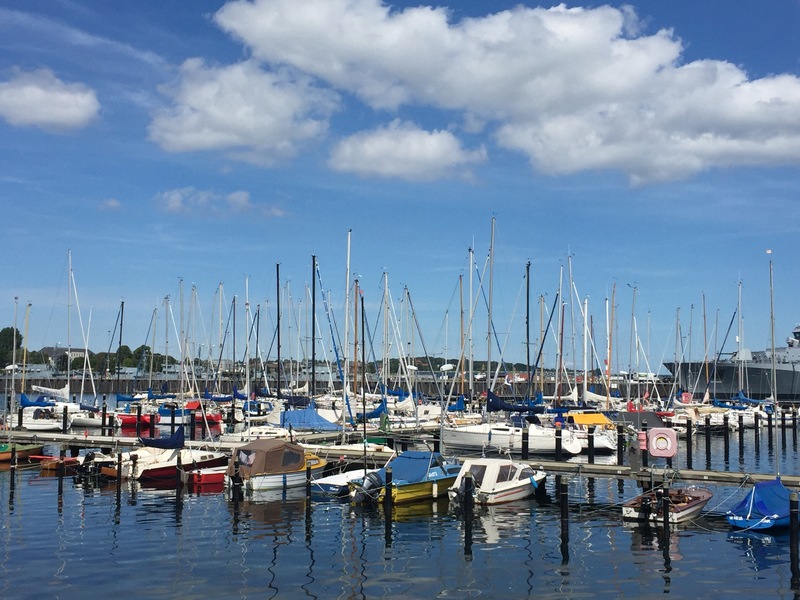 It’s a maritime town that held two Olympic sailing competitions in 1936 and 1972. It’s beautiful and relaxing while also being a fairly large city. 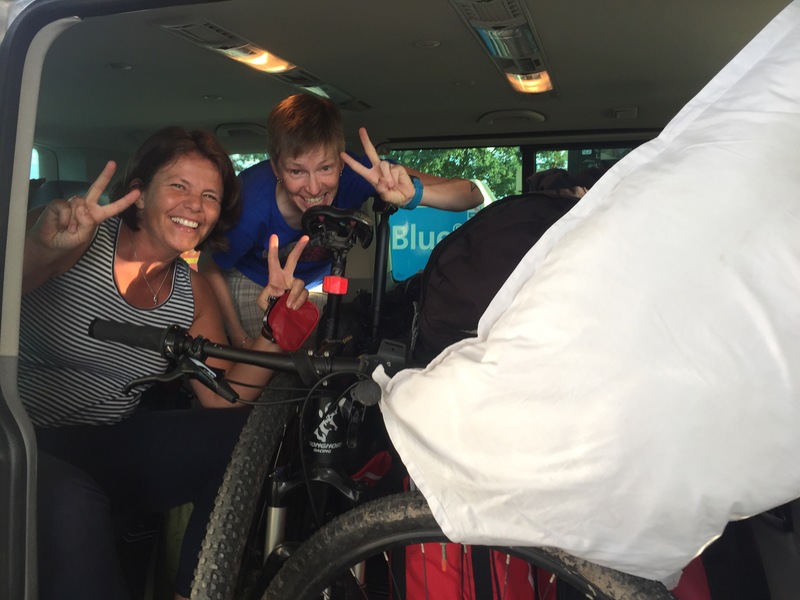 Anke had to work for a few days, but also found a lot of time to show us around, introduce us to friends, and also plan out some great training opportunities for us. Incredible! 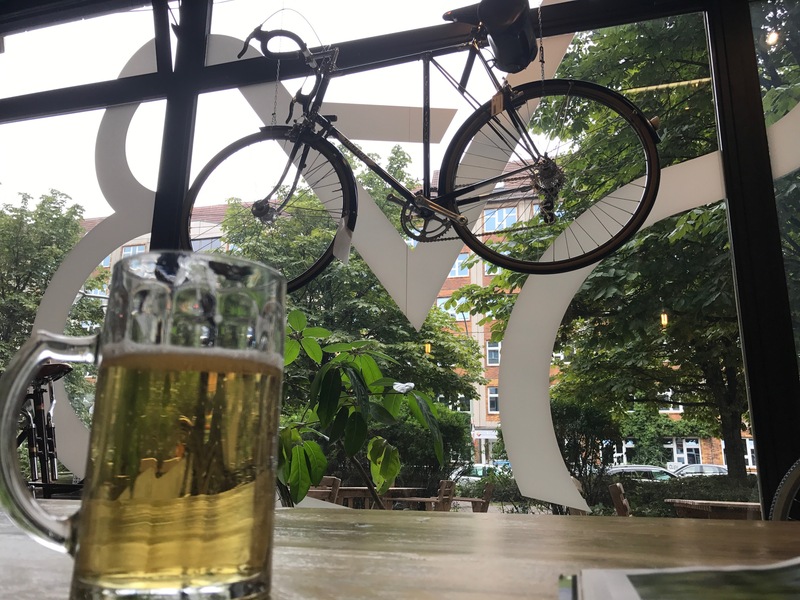 We are feeling exhausted from all the work on our brains, and ready to get back on the bikes after our week-long hiatus. This was our first ride, just to say hello to our bikes after being gone so long. Just a sweet little spin over Kiel’s sea channel on a glorious summer evening. Kiel has a free ferry that runs over the channel every 15 minutes. 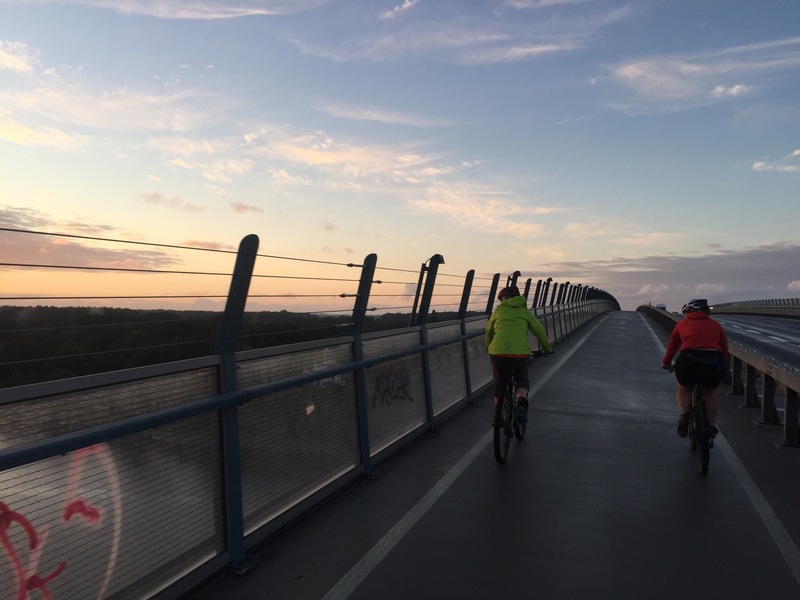 We were able to catch a ride rather than ride the bridge again. 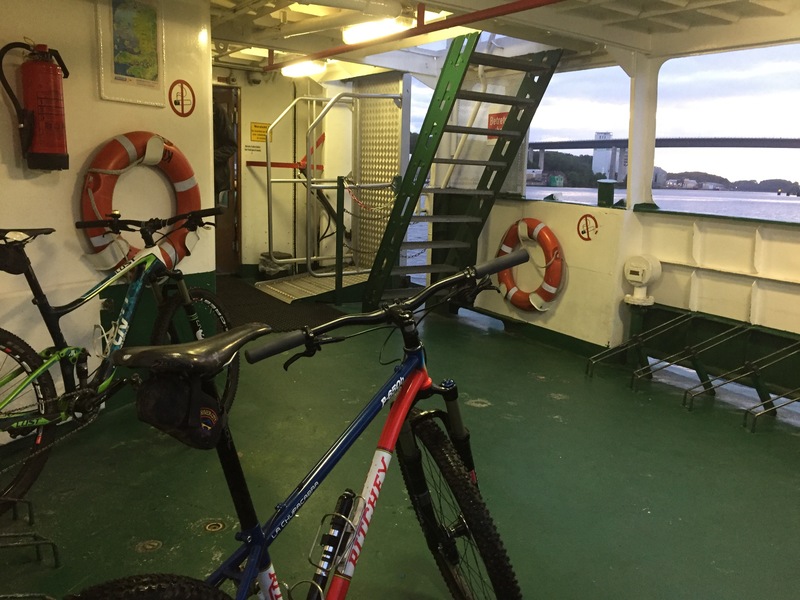 On such a tiny ferry they have 19 bikes racks! 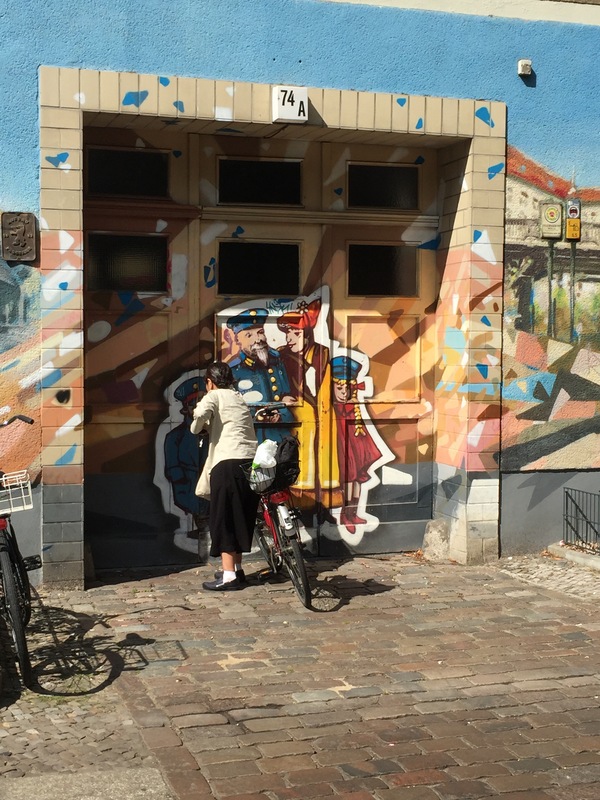 Did I mention Kiel is beautiful? 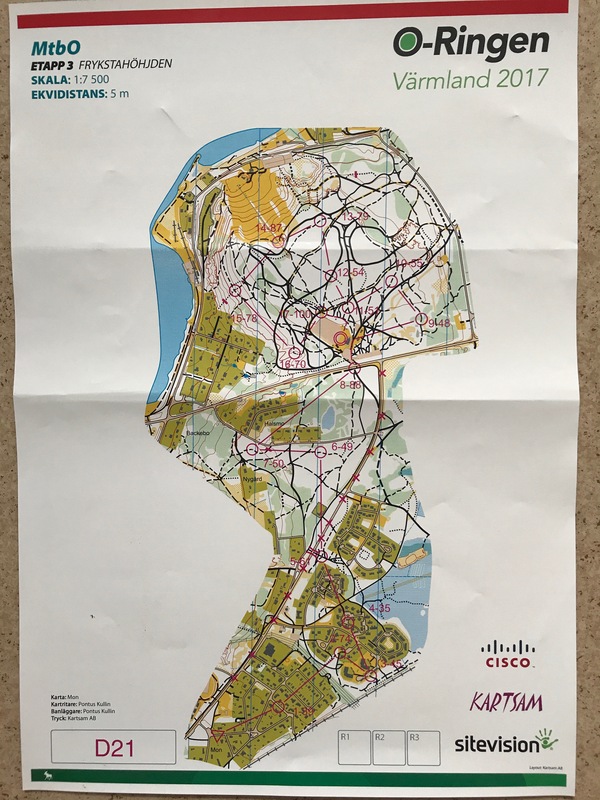 Our training has been on older maps from around the Kiel region, including a university campus in town. 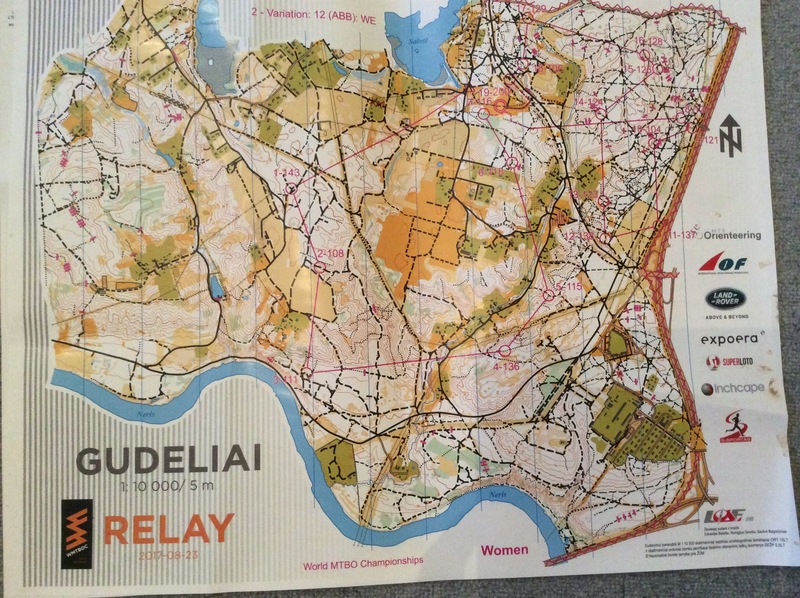 We have also been working on some mental training with older maps we’ll be using in Vilnius. Twenty minutes of brainwork and concentration turns out to be a drain! 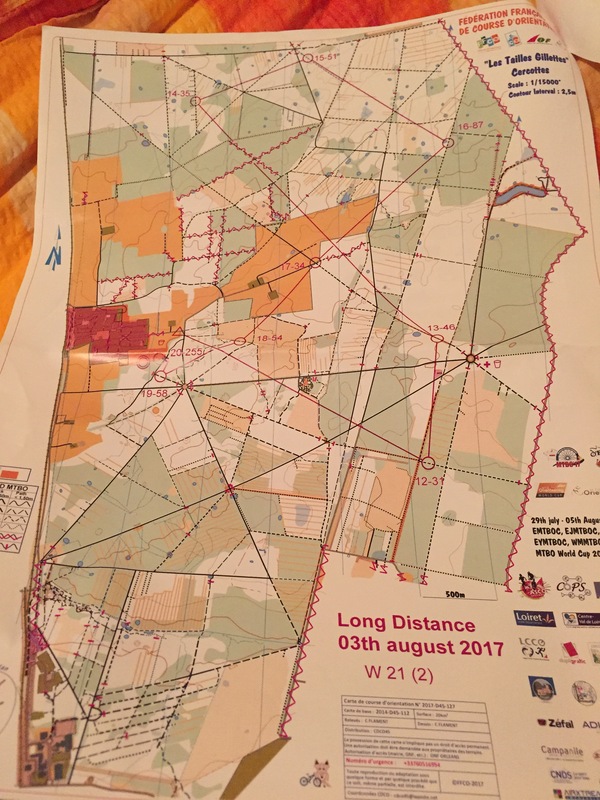 I have also ridden twice with a helmet cam so Anke can critique later and watch how I am racing/checking the map/recovering from errors. It’s been helpful and insightful, but also slightly embarrassing. But all really, really good. 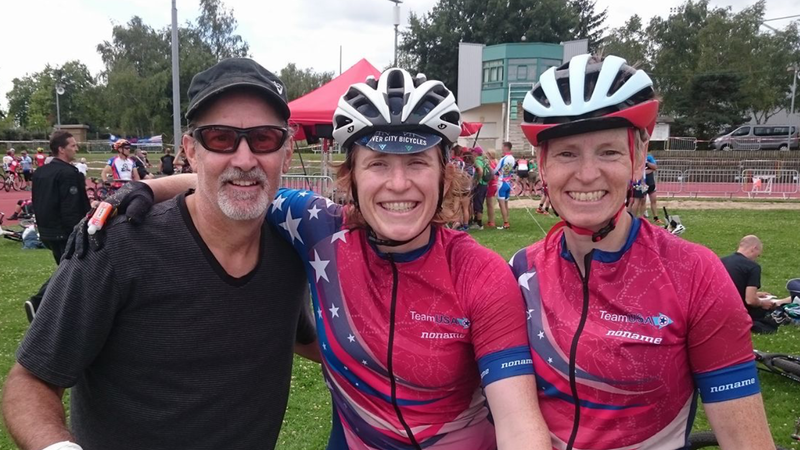 Sue and I both think it’s brought us both even more of an appreciation for the elite athletes in MTBO. 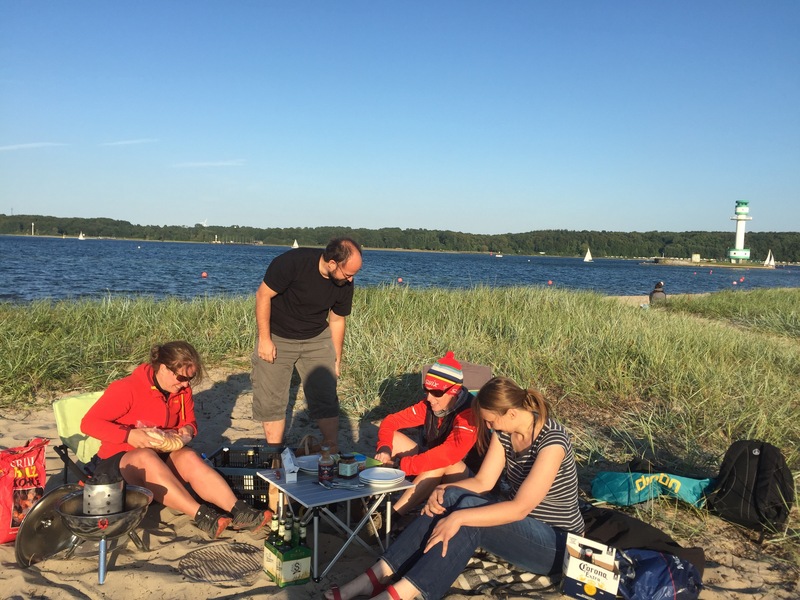 Having a really nice BBQ along the Baltic Sea that included grilling packets of red onion, tomatoes, feta cheese and olive oil. Delicious! 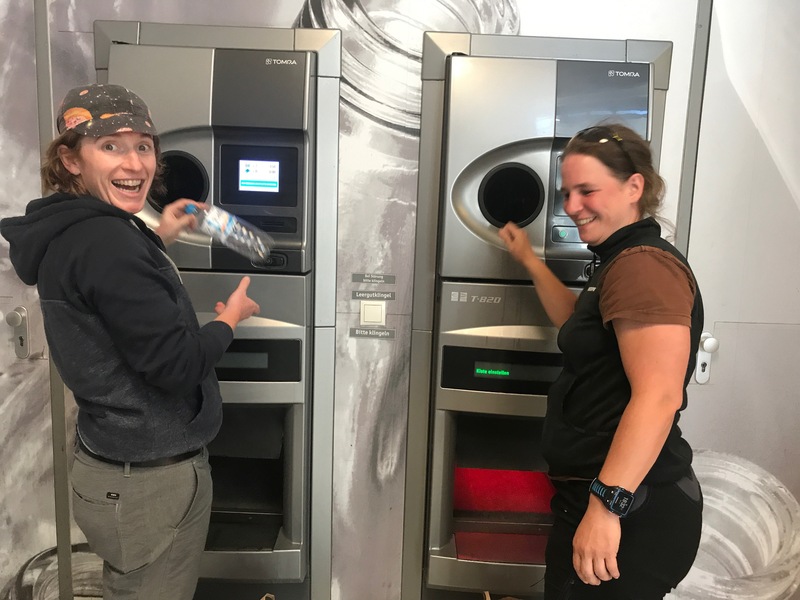 Recycling for cash Euros! This things are worth a gold mine! You can even recycle glass yogurt jars. 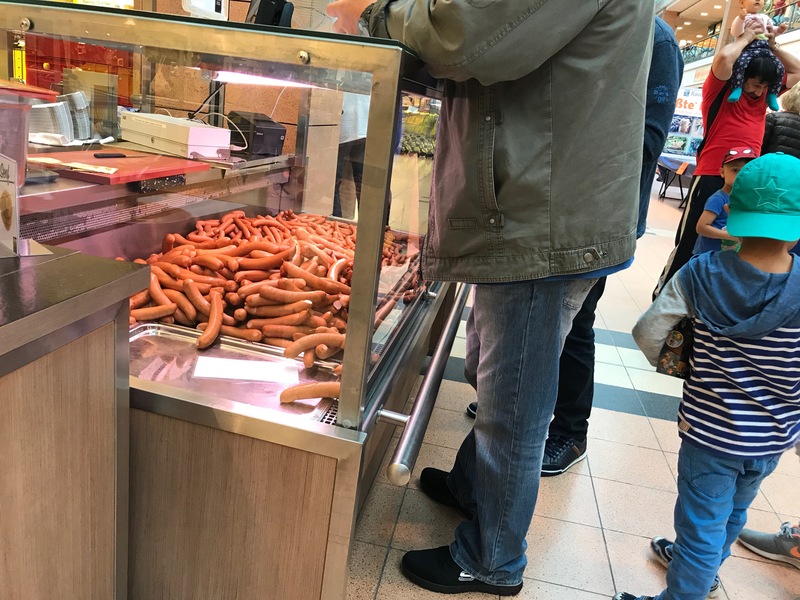 Germany is the BEST. 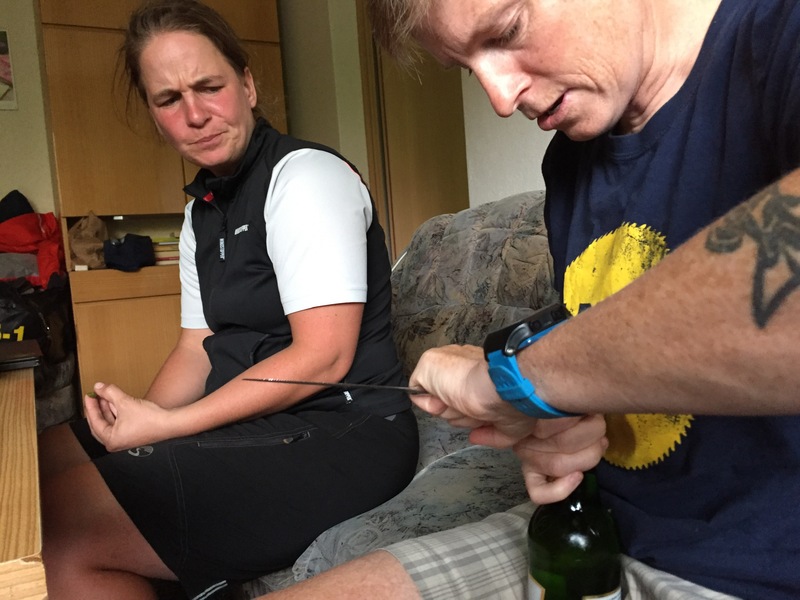 And most importantly, Anke has been teaching Sue the life skill of opening beer bottles with everyday objects. The first two are the bottom of a lighter and your average butter knife. My favorite part of this process is trying to capture Anke’s discerning face as Sue struggles. 🙂 Evidence follows. It’s been unsettling reading news from afar about the violence by the hands of white supremacists in Charlottesville and the response from our government. 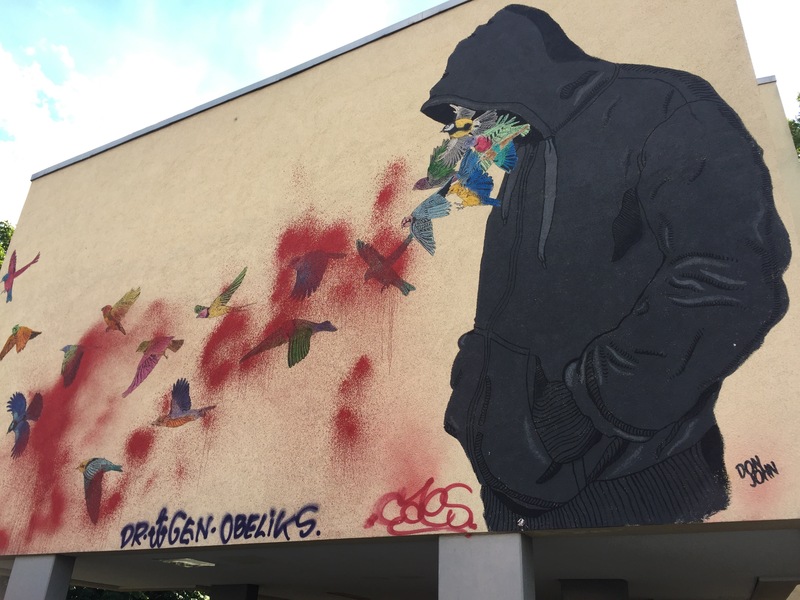 We were talking with Anke this evening and learned the city of Dresden has 10,000 alt-right supporters from the city and surrounding area who show up every Monday to rally. They’ve been doing this for two years. 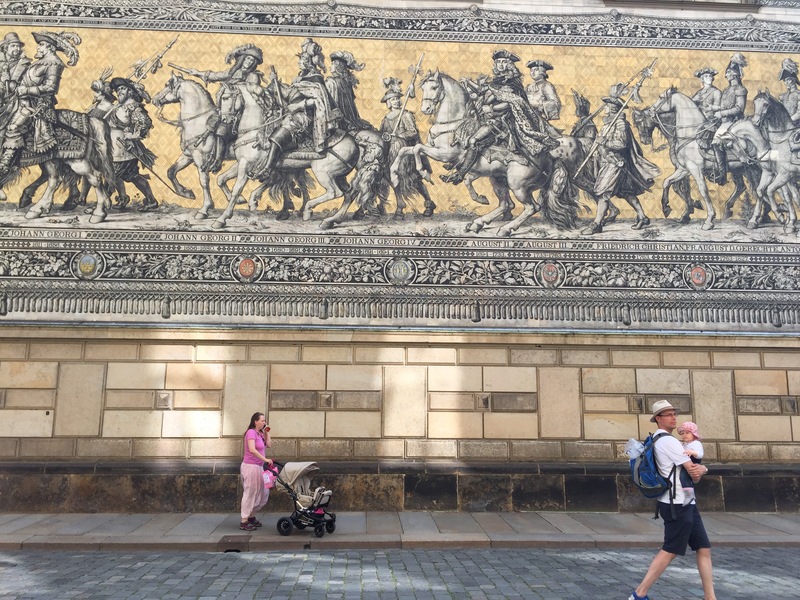 It’s died out in other cities, but remains a strong and consistent event in Dresden. She says a much smaller group shows up in opposition to the alt-right, but it’s not enough to keep the movement from growing or simply thriving. This is why it’s heartening to read posts and emails from friends, organizations, and leaders banding together to fight the good fight! 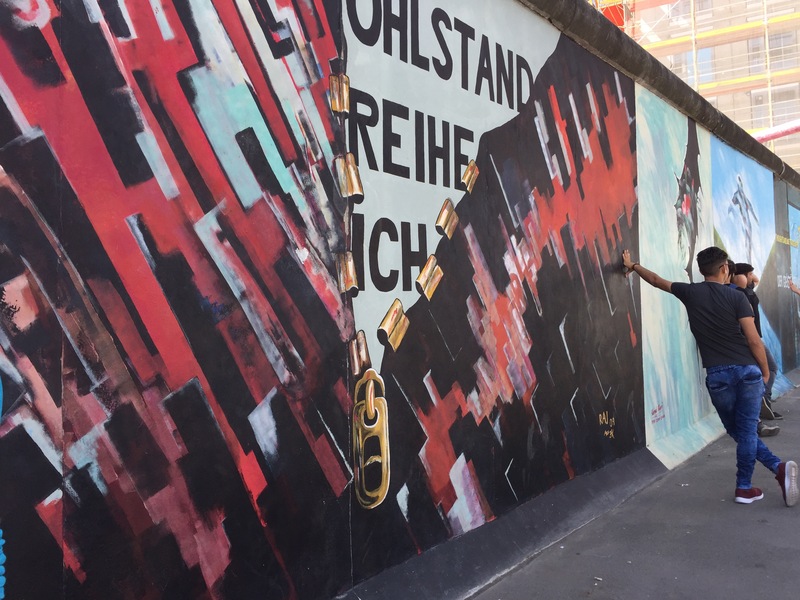 It was also heartening to be in Berlin, where they are working hard as a city to own their past and push forward messaging about peace, love, and anti-fascism. 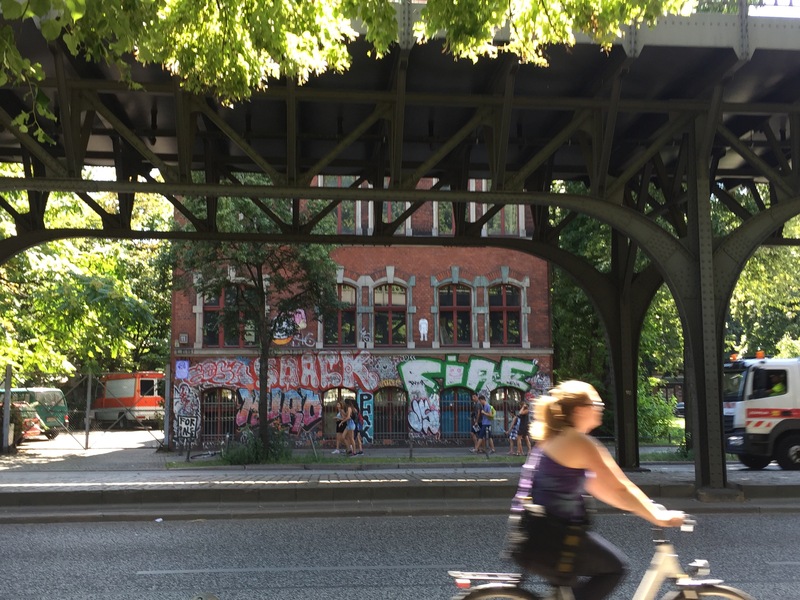 Berlin was like a living, breathing museum. 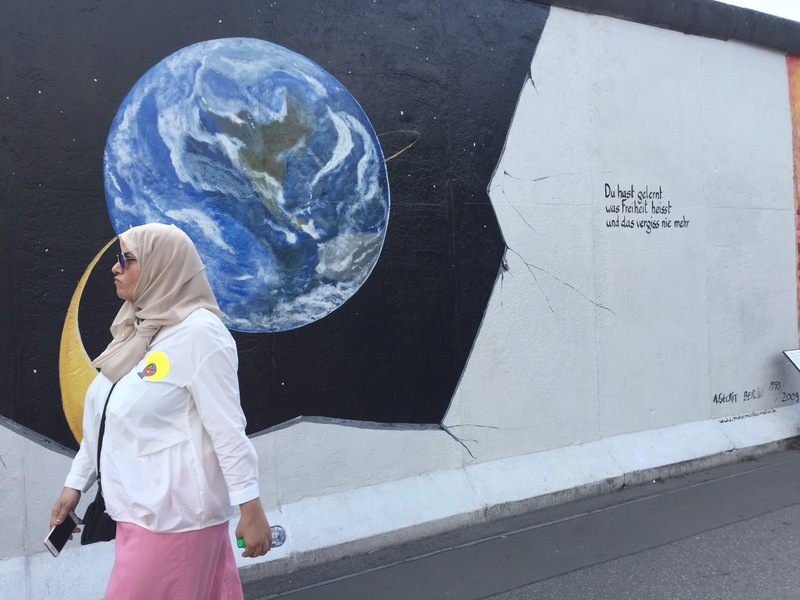 No matter where you go, you can’t avoid learning about its history. 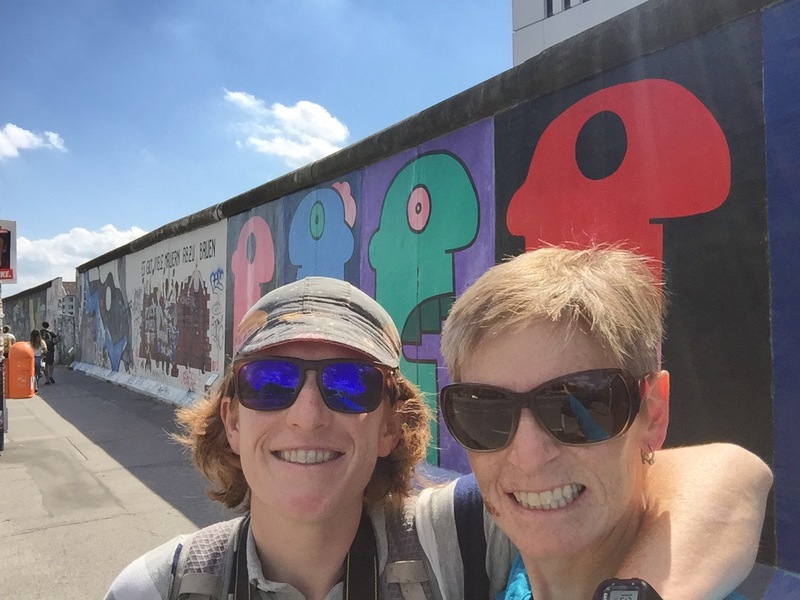 We are sore from all the walking but loved the opportunity to learn more about the Cold War, the Berlin Wall, and other small or significant events in history. 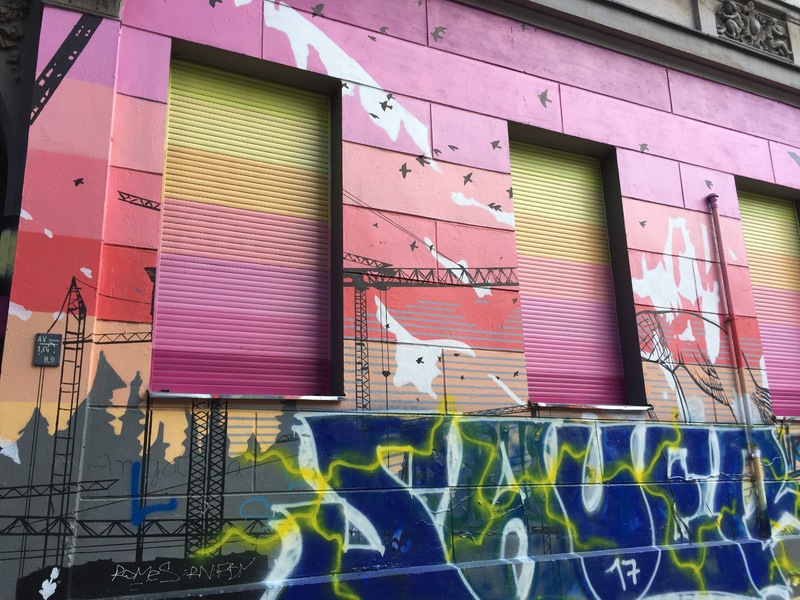 We also were struck by all the street art and large amounts of graffiti found everywhere. 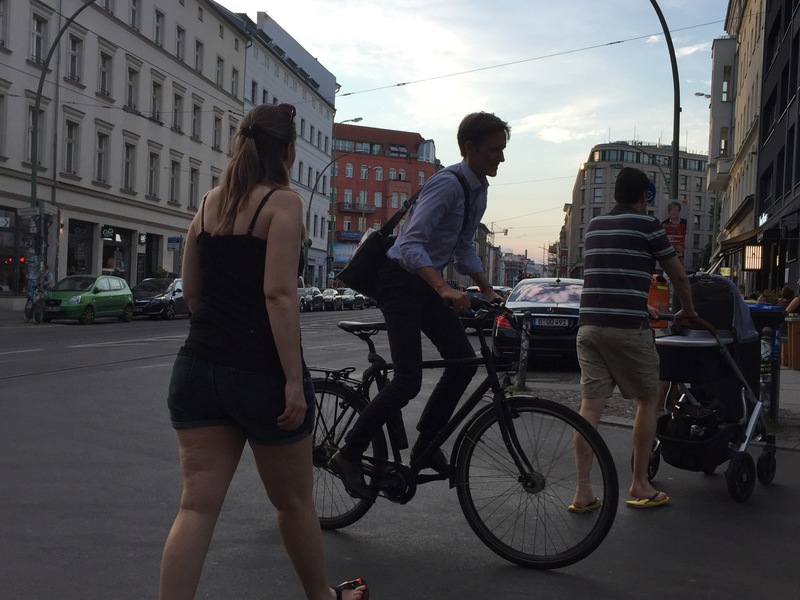 Berlin is a really stimulating city. Our senses were overwhelmed. 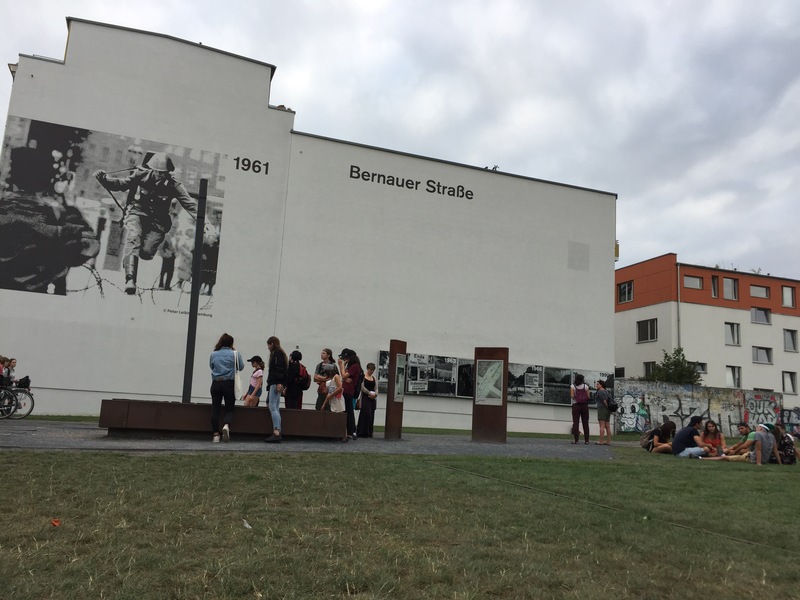 Our apartment happened to be near Bernauer Strasse, where the Berlin Wall cut right through the middle of the street, blocking off many through roads and access to the subway. 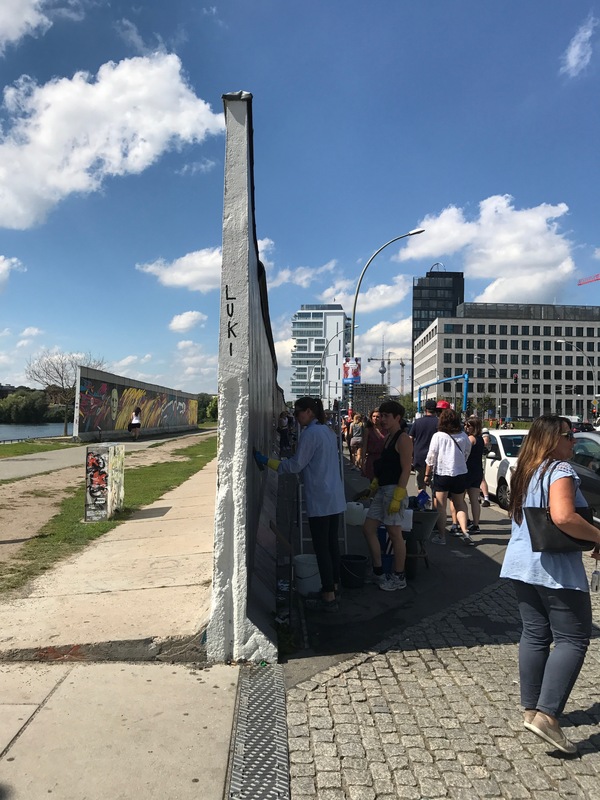 It also happened to be where the following photo (posted on the building) was taken, of an East German soldier jumping over barbed wired to escape. Apparently this was a normal occurrence, so the guards themselves began to be locked into the areas they were guarding so they wouldn’t try to bail, too. 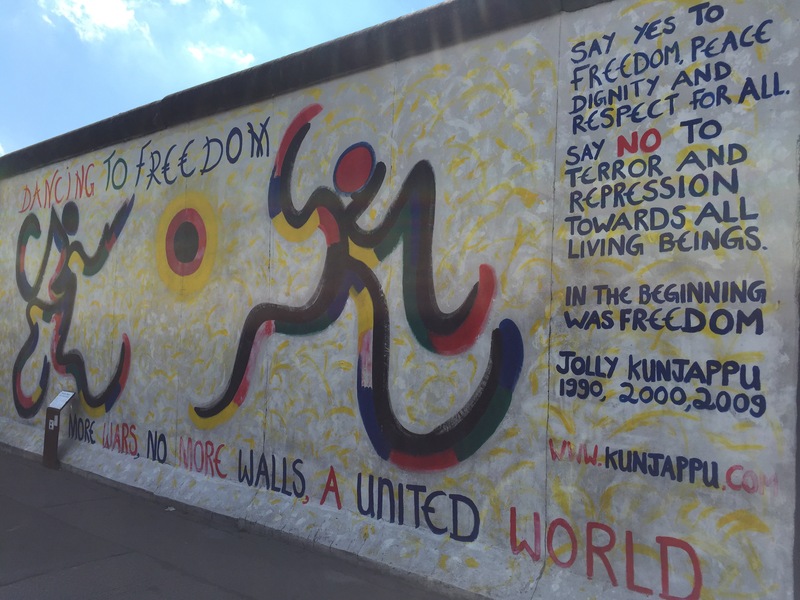 The wall also increased in size as years went by and more security measures were deemed necessary. In my photo you can see remnants of the wall on the far right, and lots of kiosks with info about that particular section of the wall. 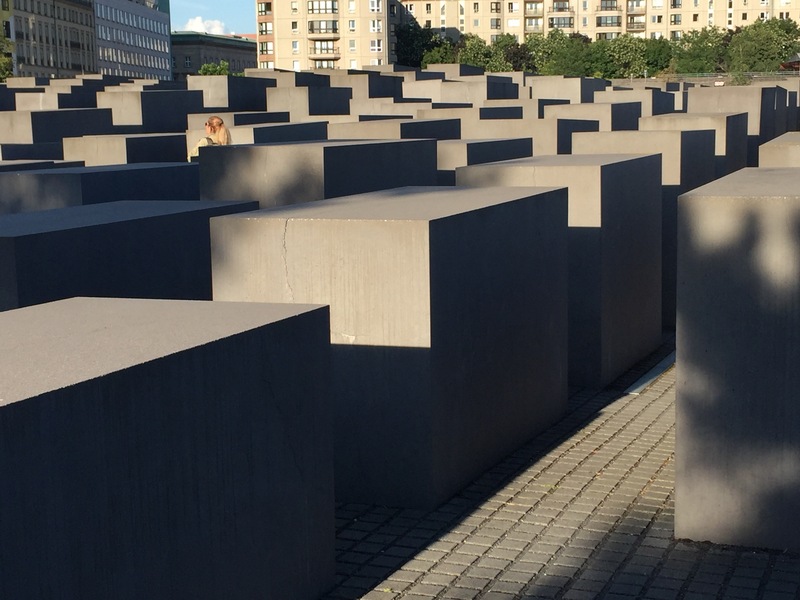 We also learned about how many unarmed civilians were killed near the wall or in “No Man’s Land.” People were shot accidentally or because they looked like they were doing something nefarious. Some were soldiers, a large amount were children, and a few were actually trying to escape. We stumbled across this memorial with more sections of the wall in the background. 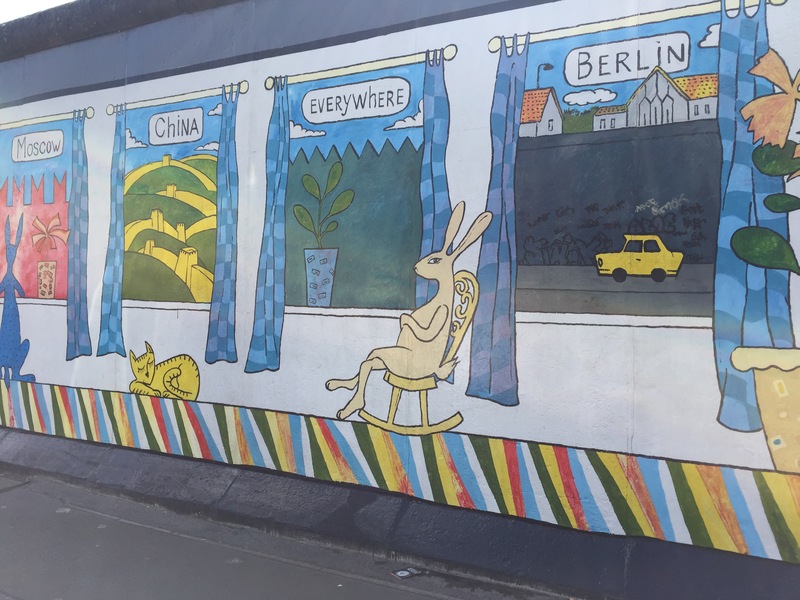 There is a large section of the wall left along the Berlin waterfront called the Eastside Gallery. That’s where you can find most of the tourists and some incredible pieces of art from so many different types of artists. It was captivating. Lots of the messaging felt very pertinent for the political climate in the US and the state of our country. 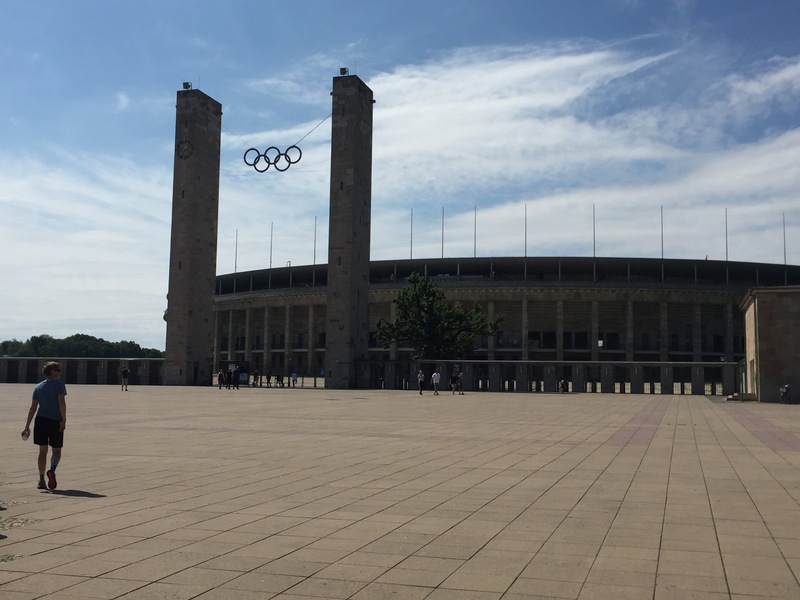 One of the only tour tickets we purchased was for the Olympia Stadion, where the infamous 1936 Olympics were held under Hitler’s regime. Sue is a longtime Olympics fan and trivia buff, so she was really pumped to see it. 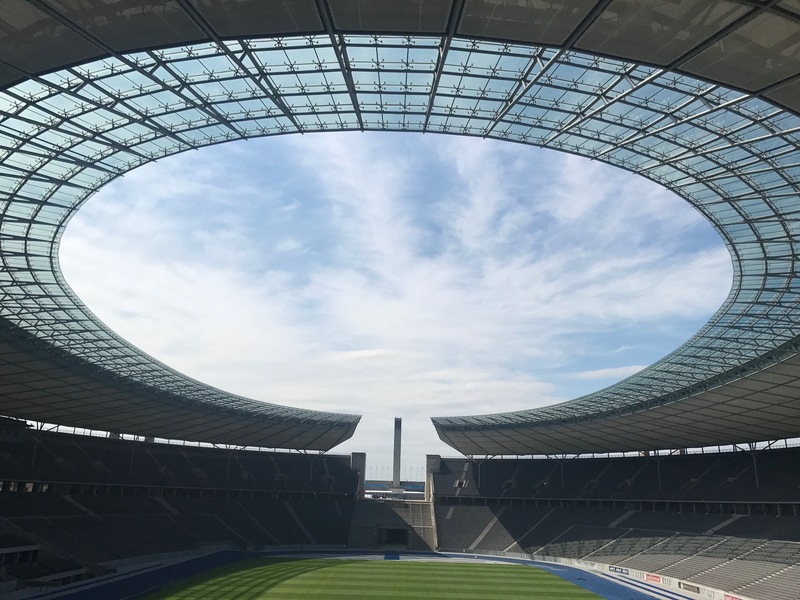 The stadium was striking and creepy at the same time, even though the interior has long been updated to host Berlin’s soccer team and major track and field events. There have also been major changes to the VIP area where Hitler and his friends would sit to view the events, most likely to keep neo-Nazi followers from coming and showing their respect. 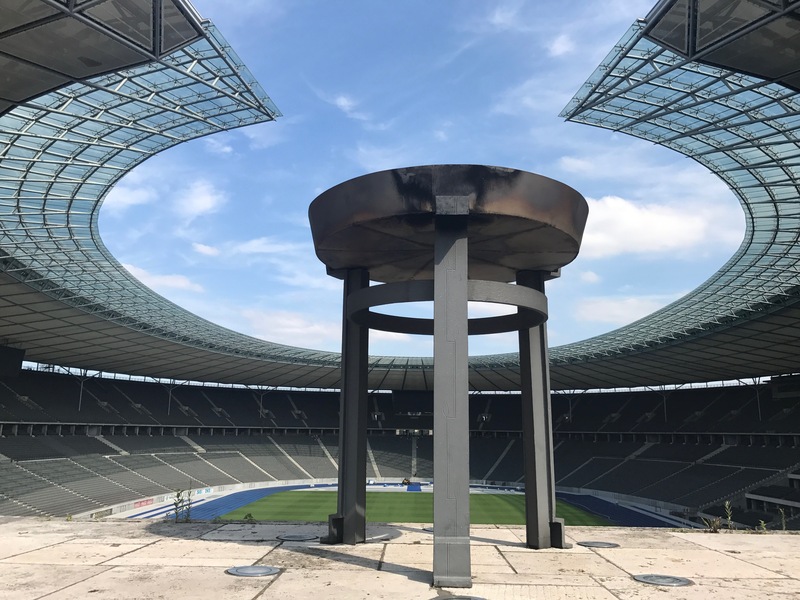 The glass roof is new, but this is the original Olympic flame holder from the games. 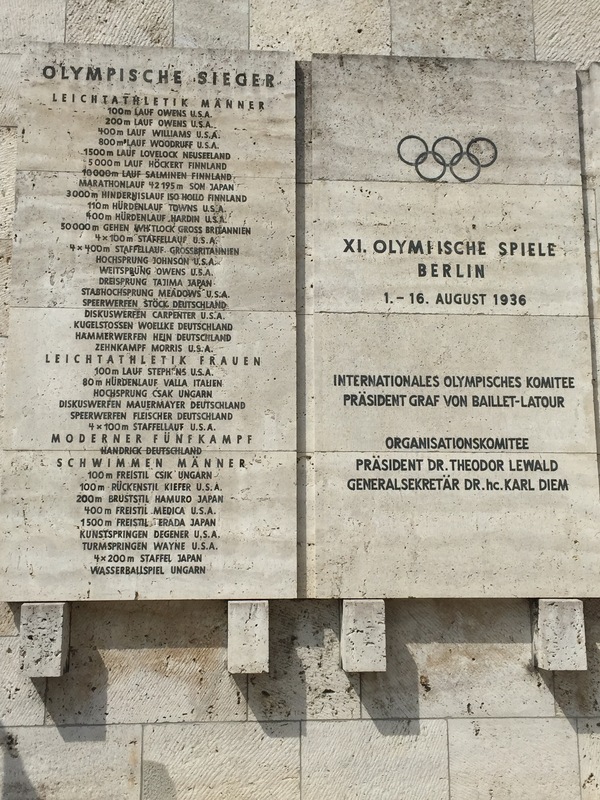 Did you know Hitler’s 1936 Olympics pretty much came up with the idea of the torch relay from Greece? It’s been at every Olympics since. And a view from the other side, with an eerie bell tower in the distance. The bell from that tower was knocked down during the war, but is still on display near the stadium. 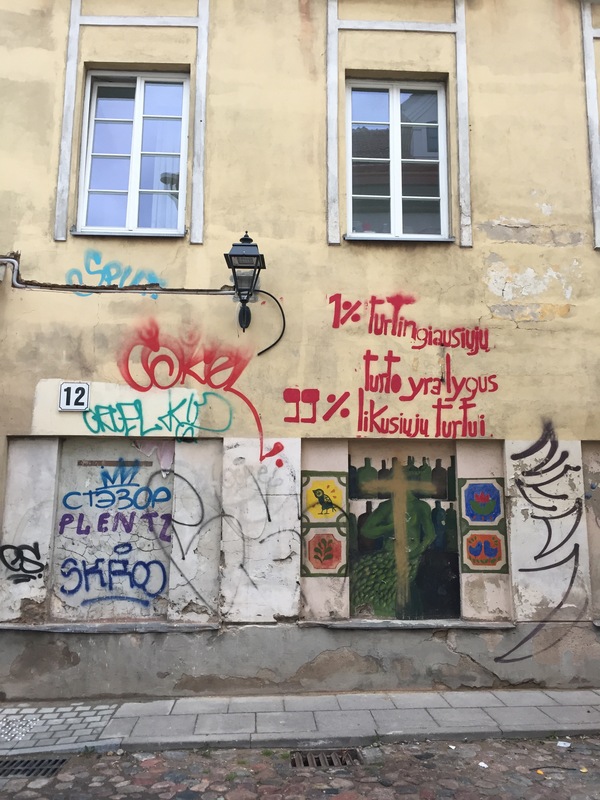 Swastikas have been adjusted so they are not quite swastikas anymore. There is a new bell in the tower now. 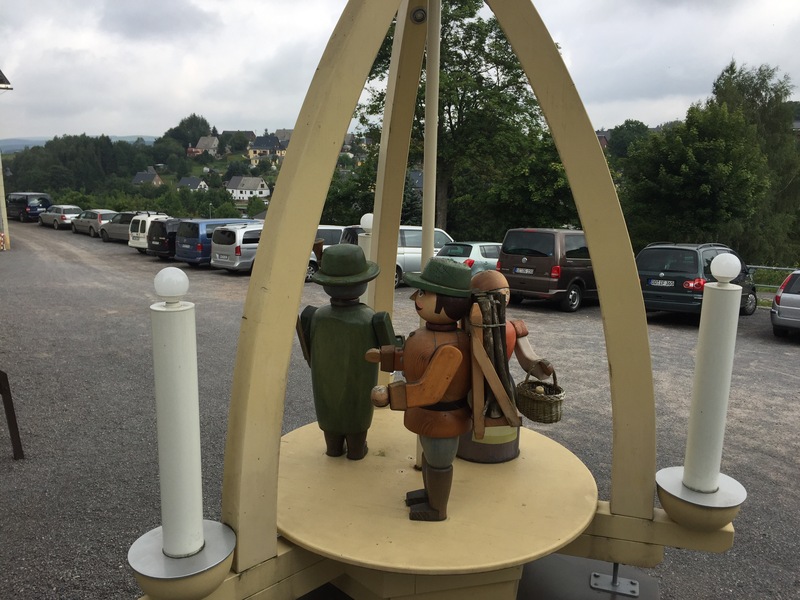 There is a large field below the bell tower where a World Cup archery tournament was taking place, which is also where Hitler-Kinder fitness camps happened during the Nazi era. Thousands of children would take part in calisthenics and other training activities on the fields. A list of some event winners, including Jesse Owens’ 100 and 200m wins for the US. 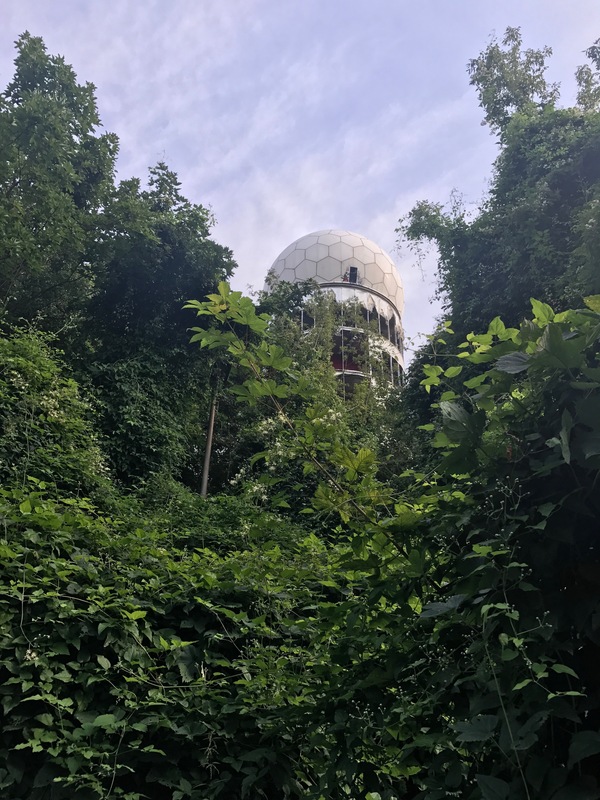 We also tried to visit Teufels Berg, or Devil’s Mountain, on the western side of Berlin. It’s a large park with a huge hilltop site that holds the remains of a former US Cold War Listening Station. 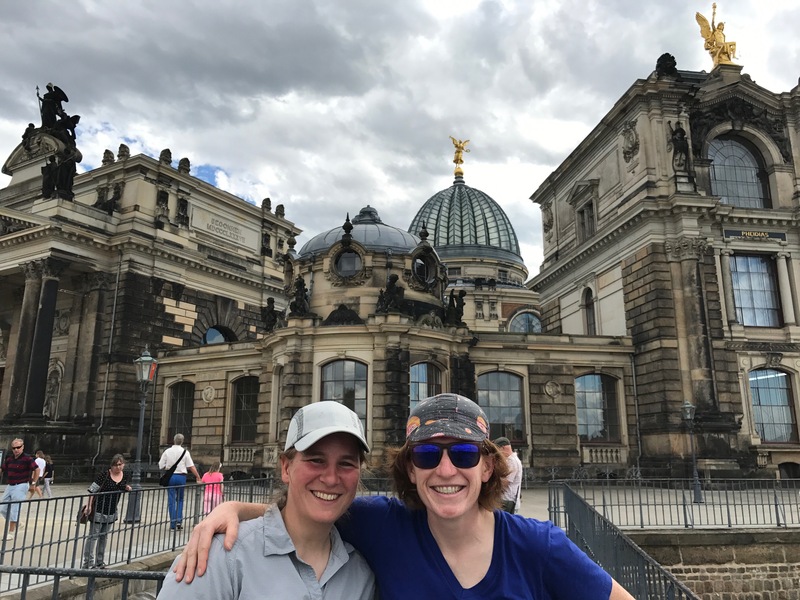 We were inspired to go visit by some photos we had seen, as there is a lot of cool art mixed in with the ancient-looking structures. Sadly, we only got a quick glimpse because of the INSANE amount of mosquitoes on the premises. I couldn’t handle it and was having a mild panic attack. We essentially just circled the hilltop and continued back down. Maybe next time? You should look it up. 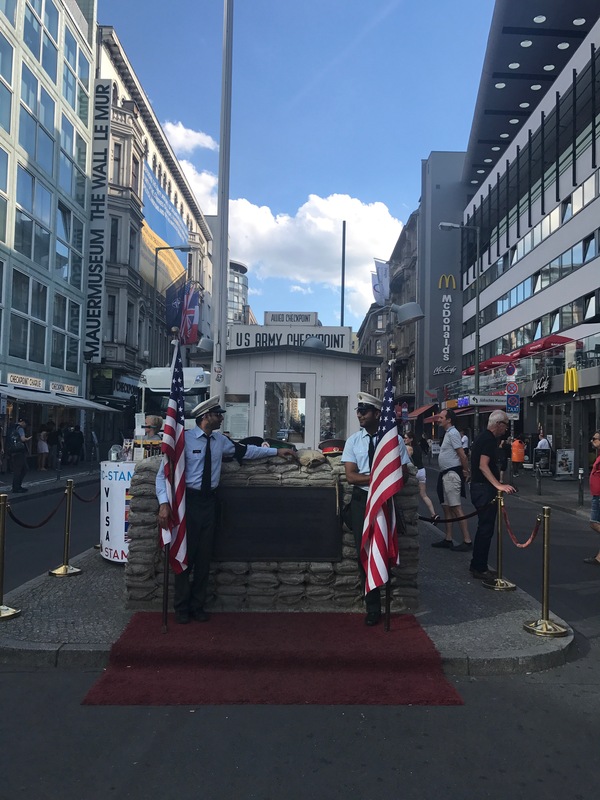 For just 3 euro you can have a photo with these two guys at Checkpoint Charlie, one of the hottest tourist spots in town. 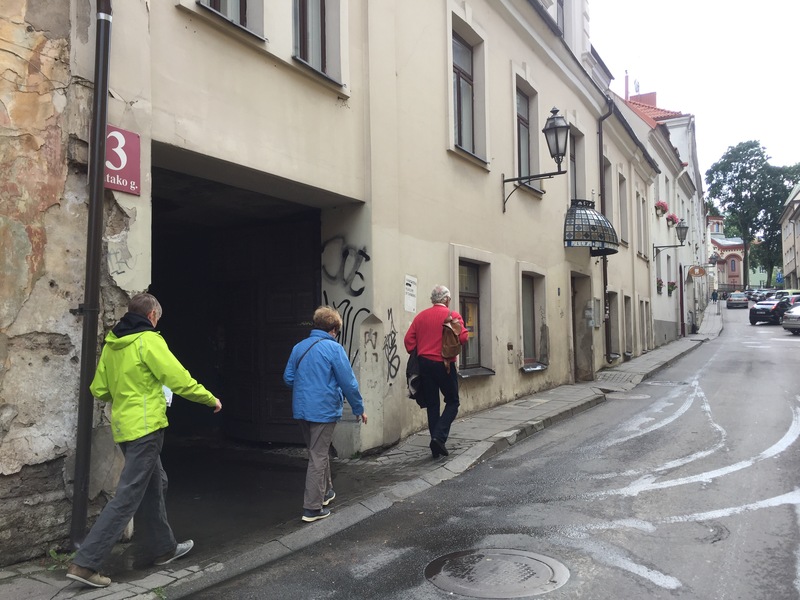 You can also almost get hit by a tour bus because the narrow streets on each side aren’t closed to through traffic. 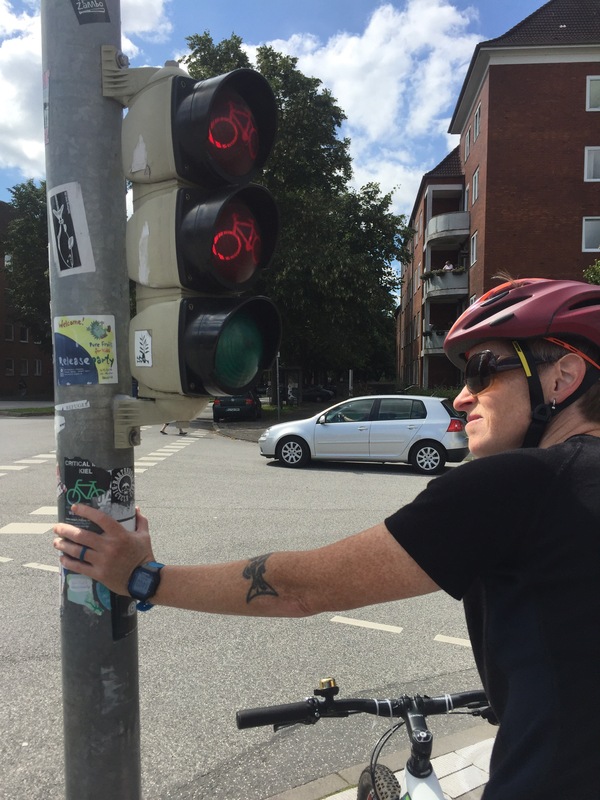 Speaking of traffic – Berlin also loves its vintage pedestrian lights. 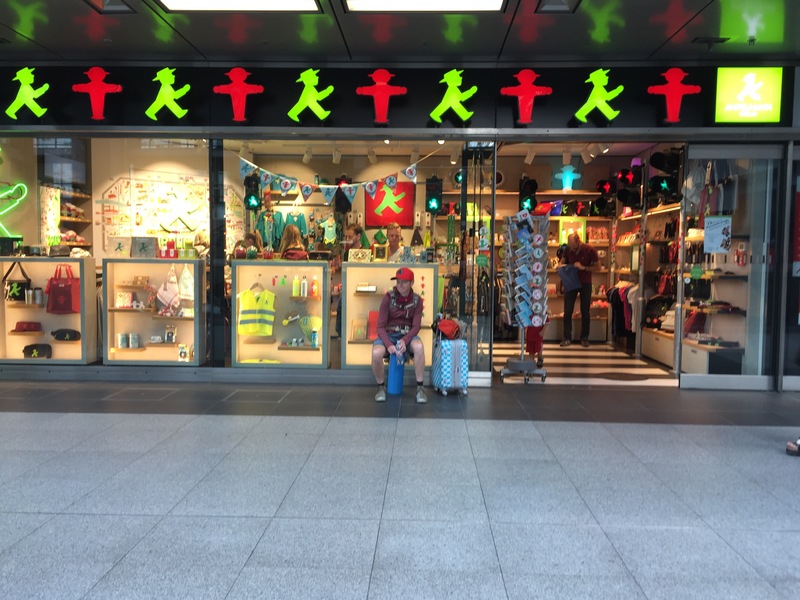 They love them so much they have their own tourist store in the train station. 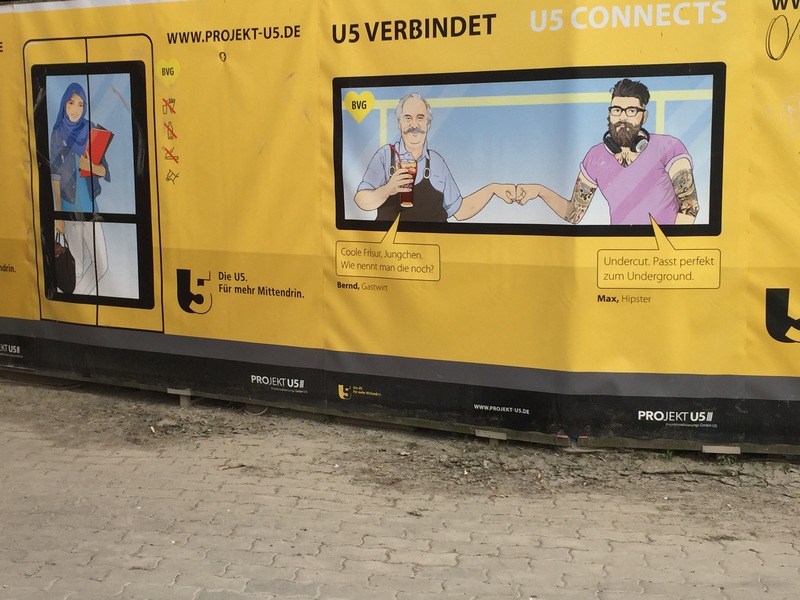 They also have really hip advertisements for their new subway line that’s under construction. 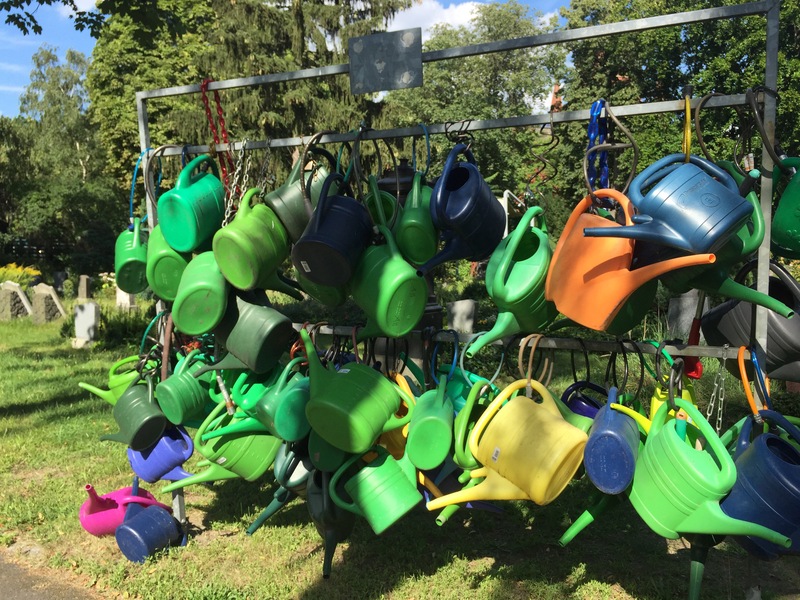 The cemeteries are filled with locked watering cans so people coming to tend their family plots don’t need to carry them everywhere. 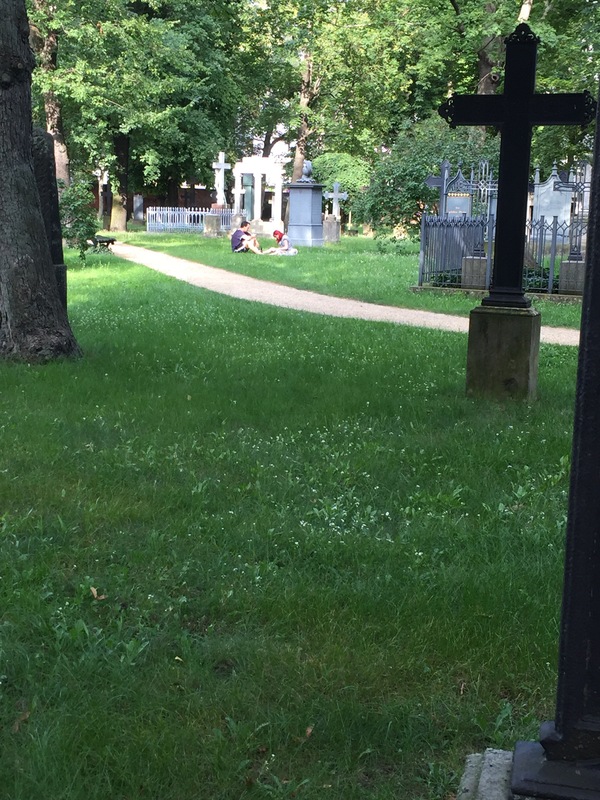 We’ve also seen more than a few people picknicking, sunbathing, or just reading in cemeteries. This totally makes sense — it’s the quietest place to be in a big city. 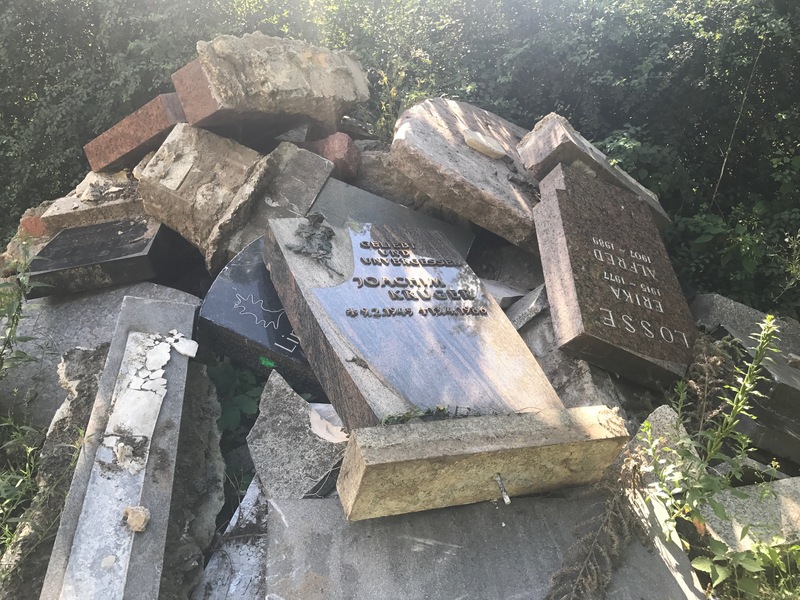 We also found out what happens to old headstones? We think? There was just so much of everything. Perhaps a city to be revisited. 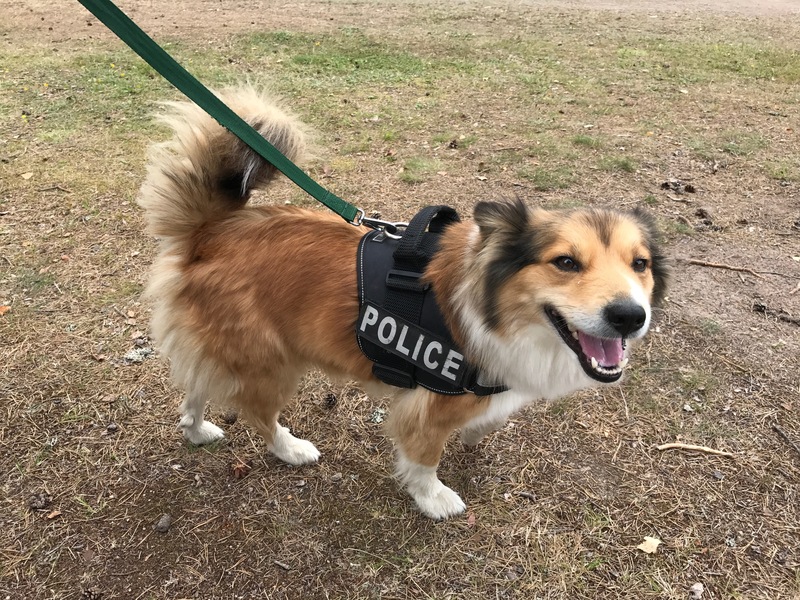 Here are a few more photos, just because there was so much and we are making a stretched attempt to pull everything together into one post. We’ll leave you with this one to finish. 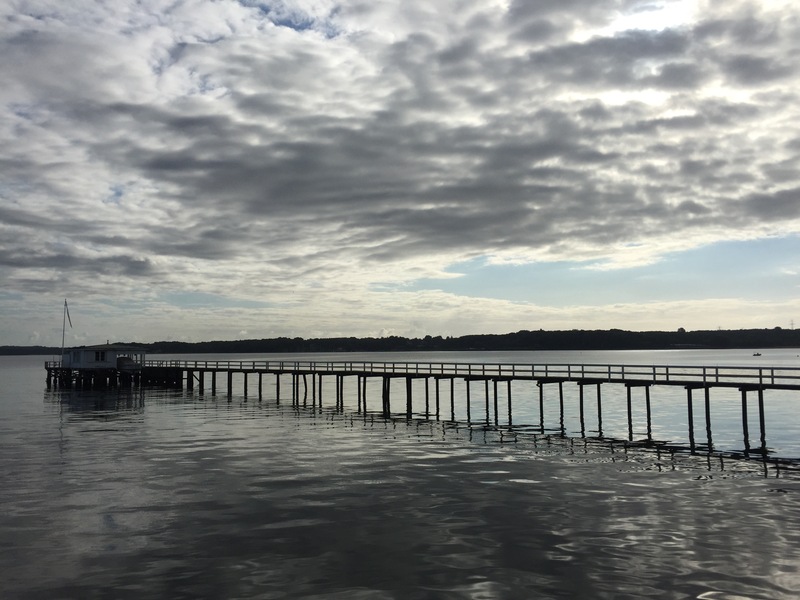 We are deep in the midst of our “Anke Training Camp” in Kiel and need to head out for our afternoon map practice. More on this later. Thanks for reading! And then we started hanging out with people! 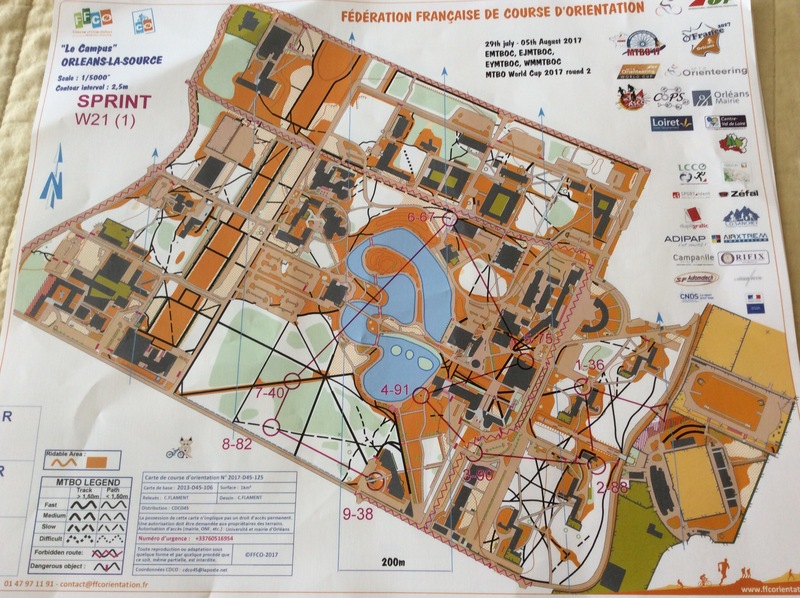 Held at Orleans University campus, this was a fast-paced sprint that reminded us both of the foot orienteering sprint camp we attend every year in Vancouver, BC. It was FUN but we both had some major errors and I got a flat at control 9. I was able to fix it and get back in the game, but it was a lot of time lost. 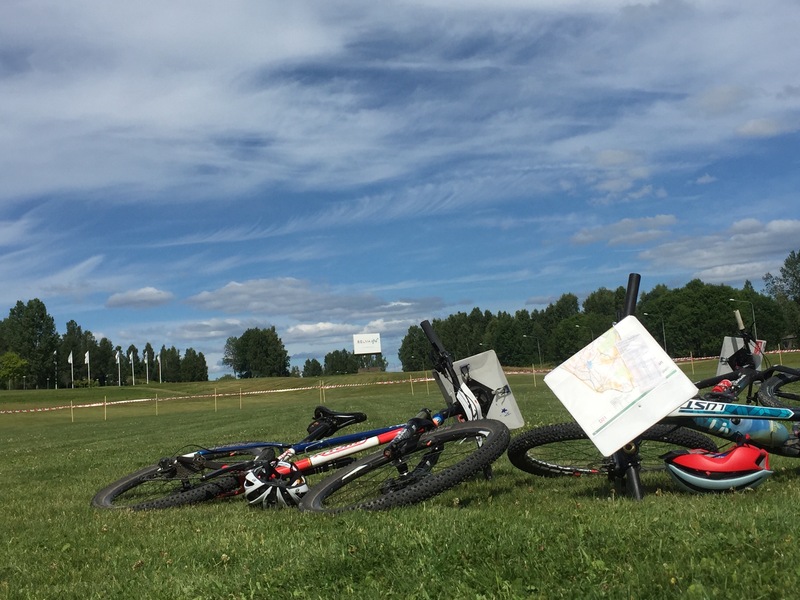 Over all it was an excellent course that was really challenging when paired with the fast pace of riding a bike. 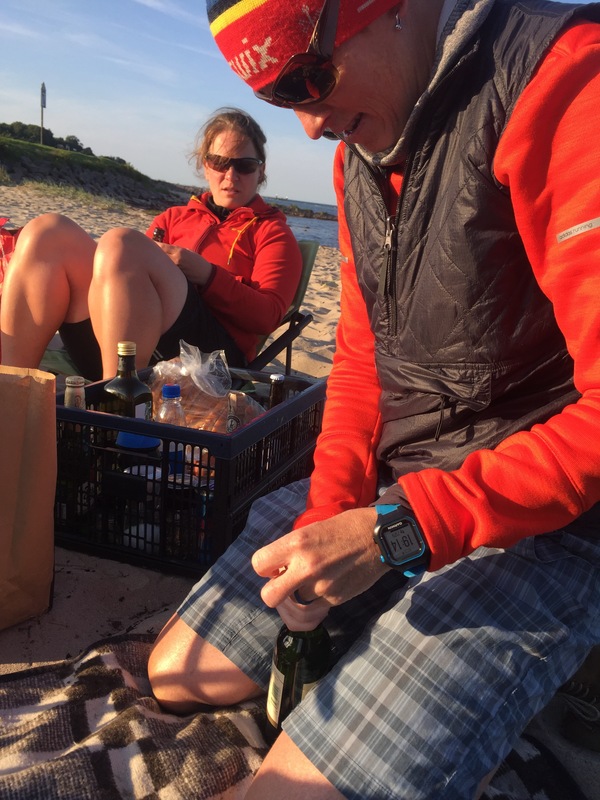 This trip has been particularly wonderful because of the opportunity to connect with Malin and Pescho from Sweden. 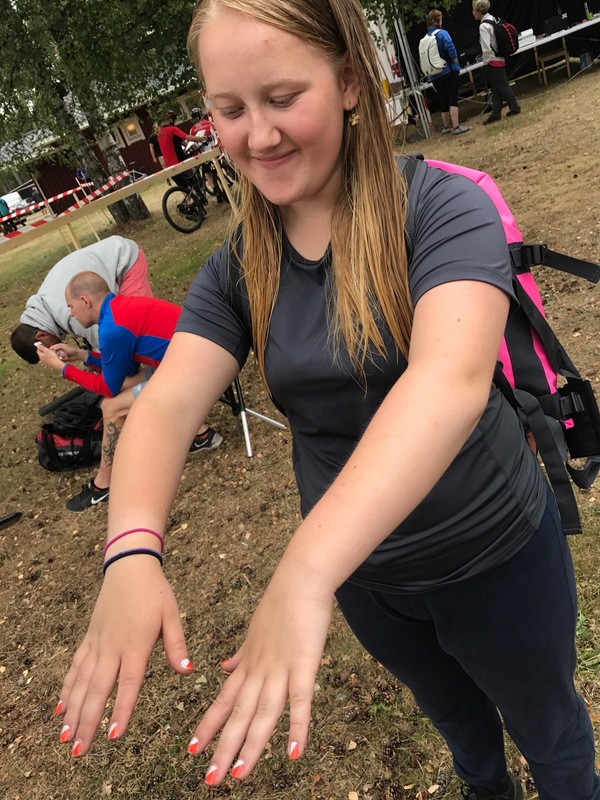 It had really made our trip a lot more fun as we meet new people and learn about other countries, all whom have the same orienteering veins running through their bodies. Here’s a few pics of some hang outs. After the model (practice) event, folks from Sweden, New Zealand and Ireland/Great Britain were all eating and chatting about orienteering and other fun things. 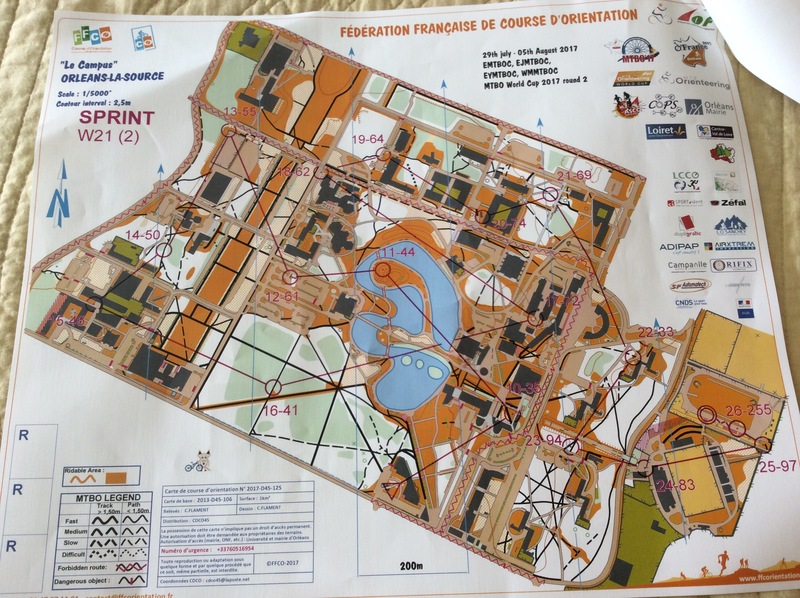 Fellow US racer, Joe Brautigam, is also here in France competing in the Men’s 50 category. This is him super happy after his top ten finish in the sprint. 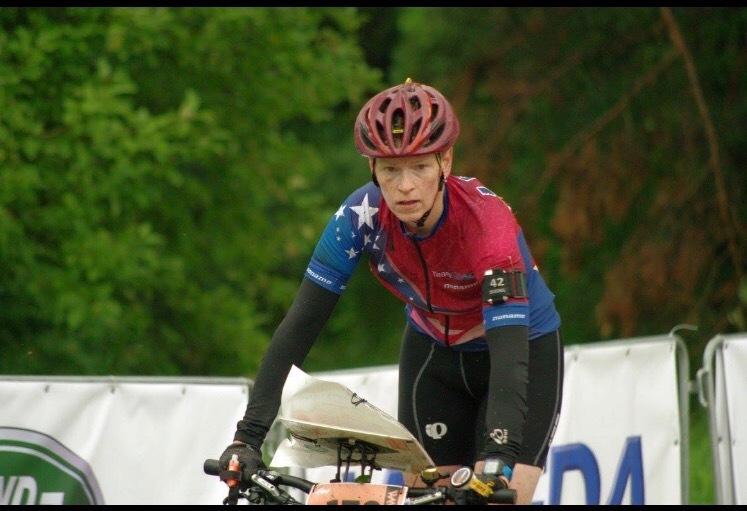 Joe is a long-time orienteer who has competed for the national foot-o team at the World Champs as well. 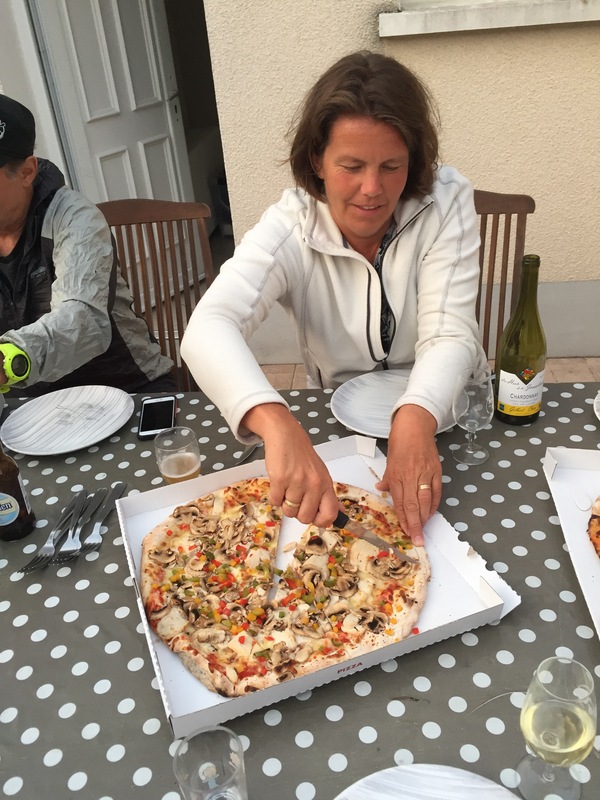 Malin is really good at helping us all sit down to nice family style meals, and also really good at speaking French so she can help us order a pizza when no other places are open. 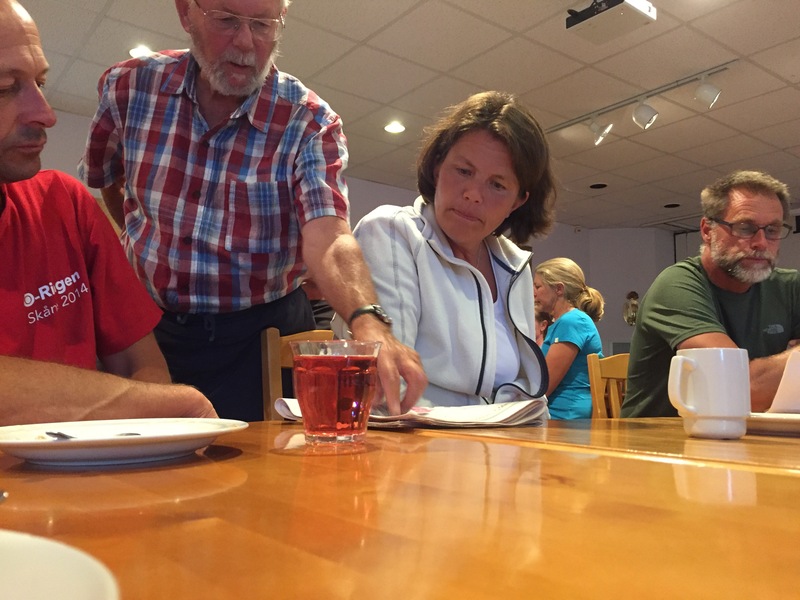 Here we are eating some delicious pies and enjoying a little white wine. 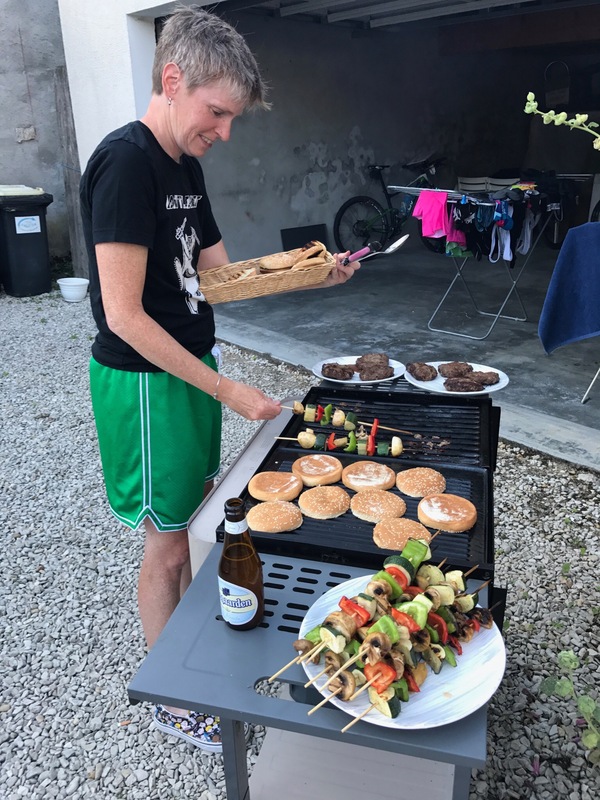 Sue and I grilled some classic American burgers, veggie kabobs, and a pear and bleu cheese salad for the Swedes and Joe one evening on our house patio. Tres bon! 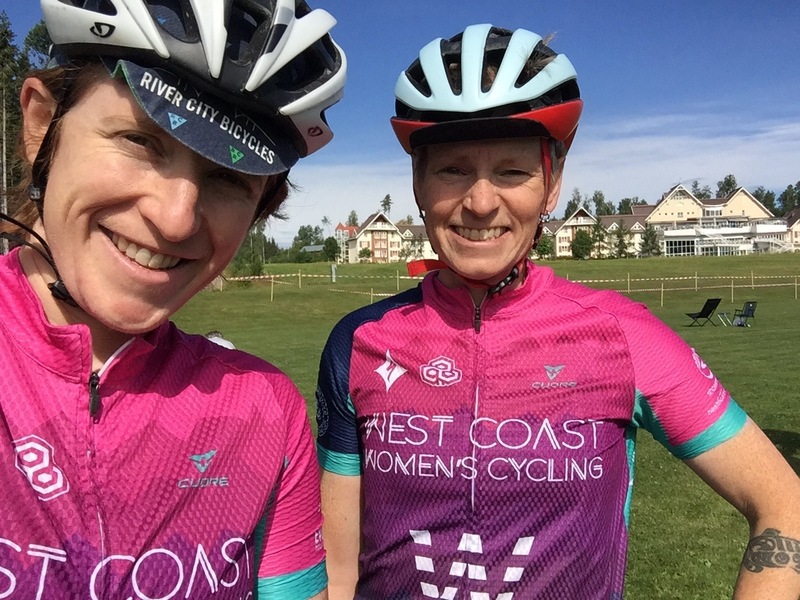 3) World Cup Middle Distance Race — Yay for Sue! Abra not so much. 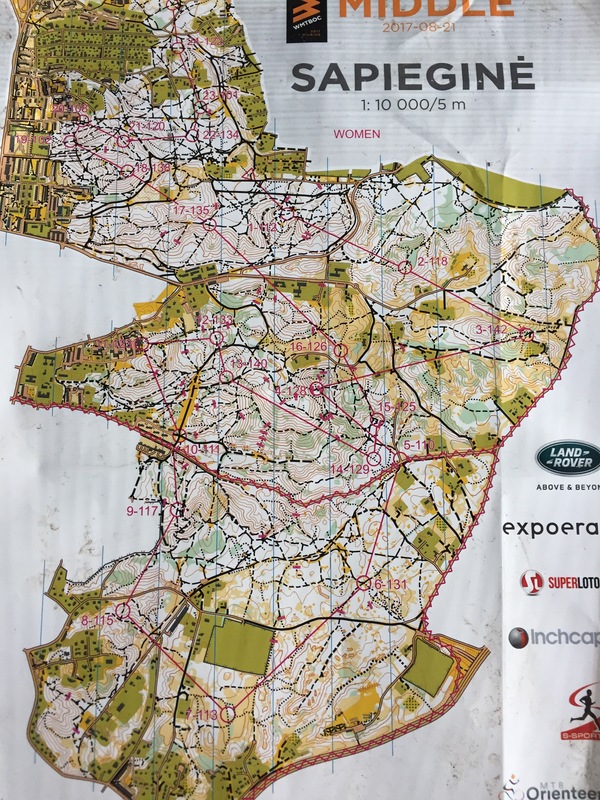 The Middle Distance was a mix of high speed straightaways blended with tight webs of trails where you had to slow down and concentrate. It was a challenge to mix between the two formats. 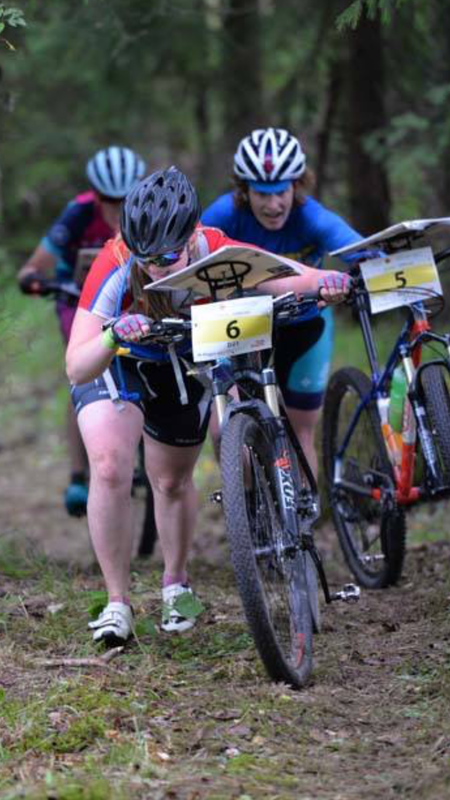 Sue had a really great race up until leaving control 16, where she headed towards 7 instead of 17. Based on the proximity of those two controls (7 and 17), I can see how that could happen! I had a strange mental block leaving control 5 and misplaced where I was. This ended up in a 6 minute error on a control that should have been fairly straightforward. 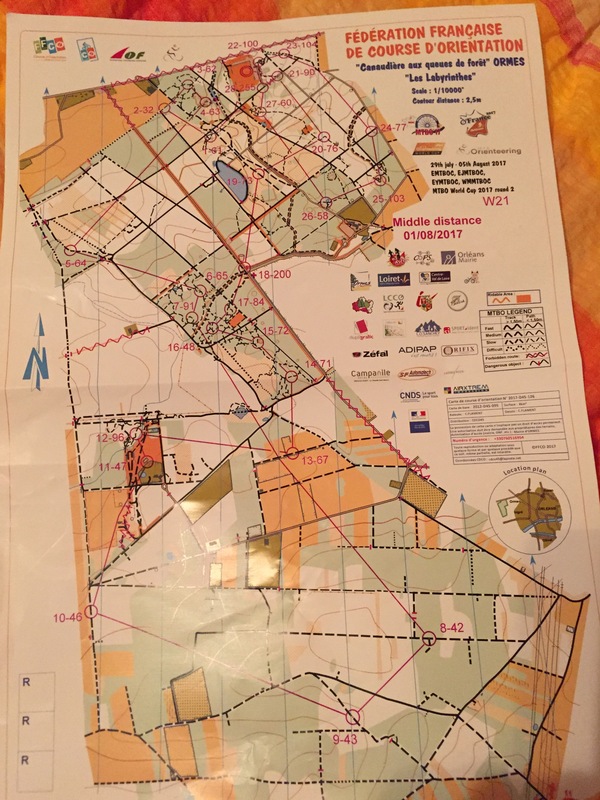 Such is life and such is orienteering! 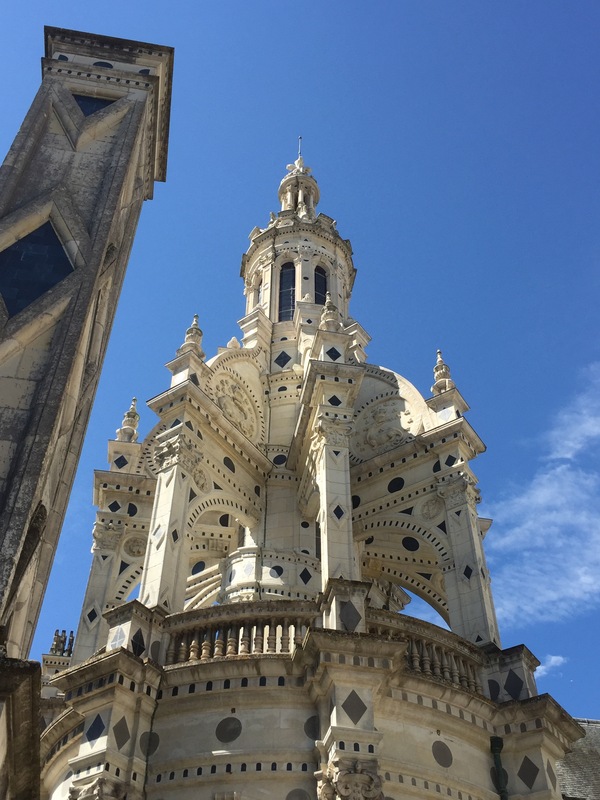 Turns out there are a lot of castles (chateaux) in France! 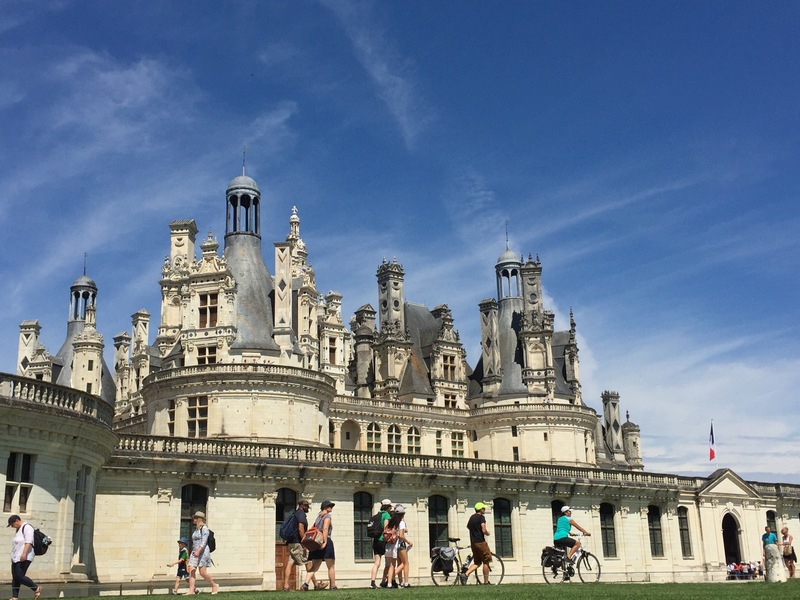 We took a team trip (meaning Joe, Malin and Pescho — so really a house trip) to Chambord castle just outside of Orleans on our rest day. 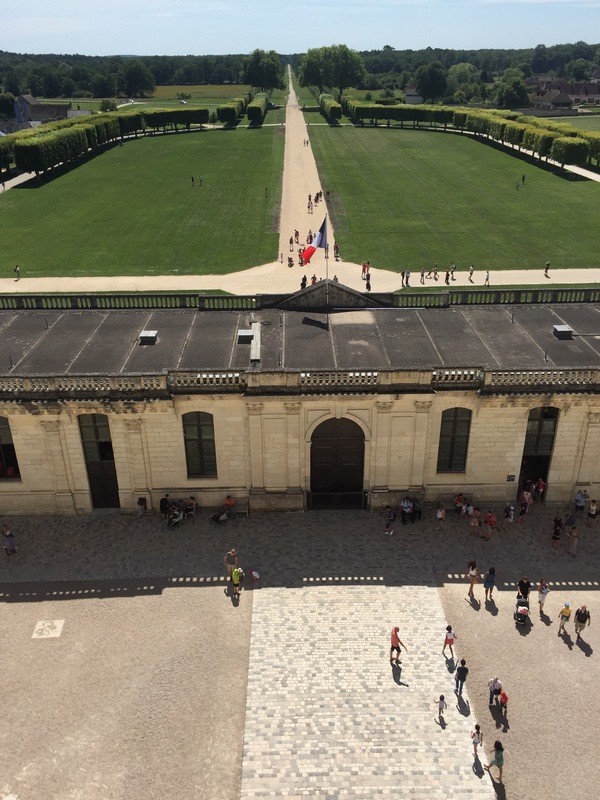 Chambord has a 38km wall surrounding its grounds along with a double helix staircase inside where you can walk up one set of stairs at the same time as another person (on the second set) and look at each other across the hall but never cross paths. When will IKEA think of something like this? 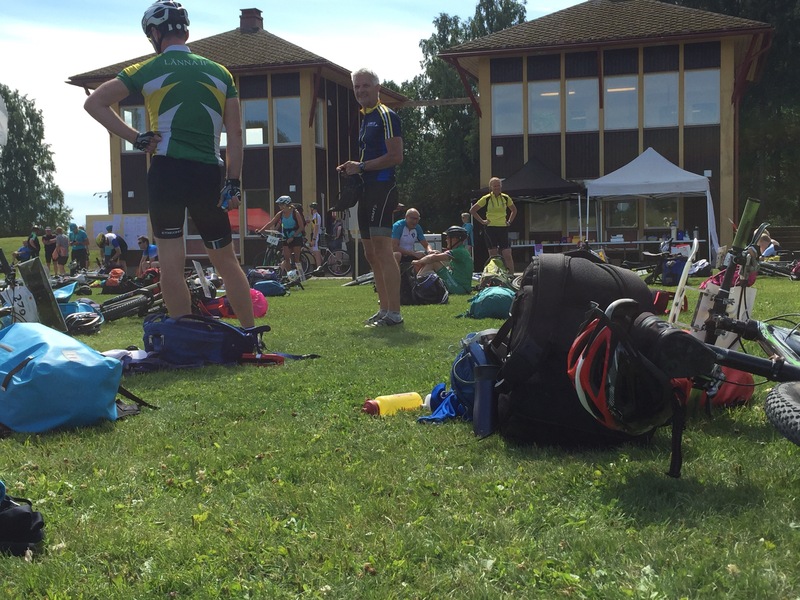 🙂 We ran into the Austrian, German, and Russian teams, and also a few other Swedish masters. 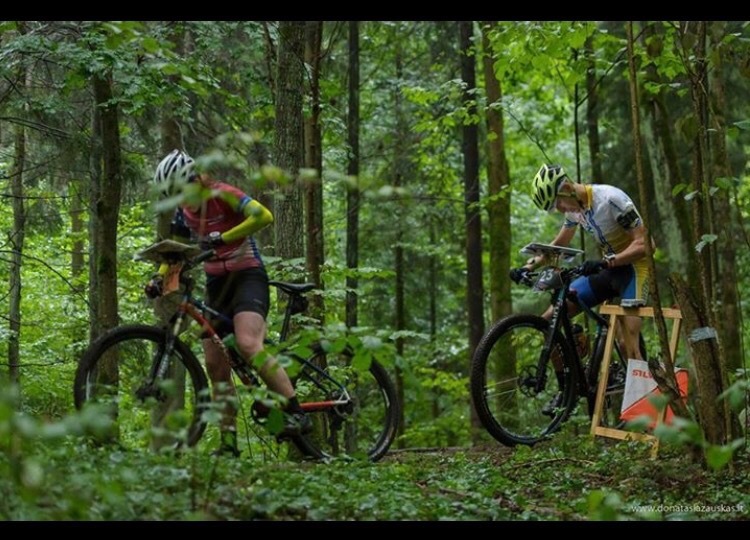 5) World Cup Long Distance Event — No Hills, Just Pedaling! The Long Distance was a strange one. 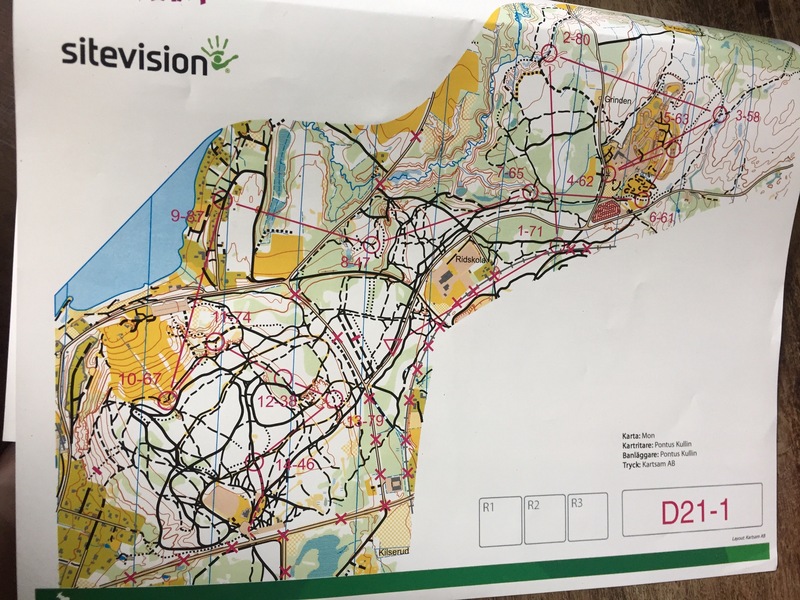 Fairly simple orienteering with really long legs and lots of pedaling. There was hardly any time to rest. Powering through long stretches of road became the norm. It was a very different style of race than we’ve had before. 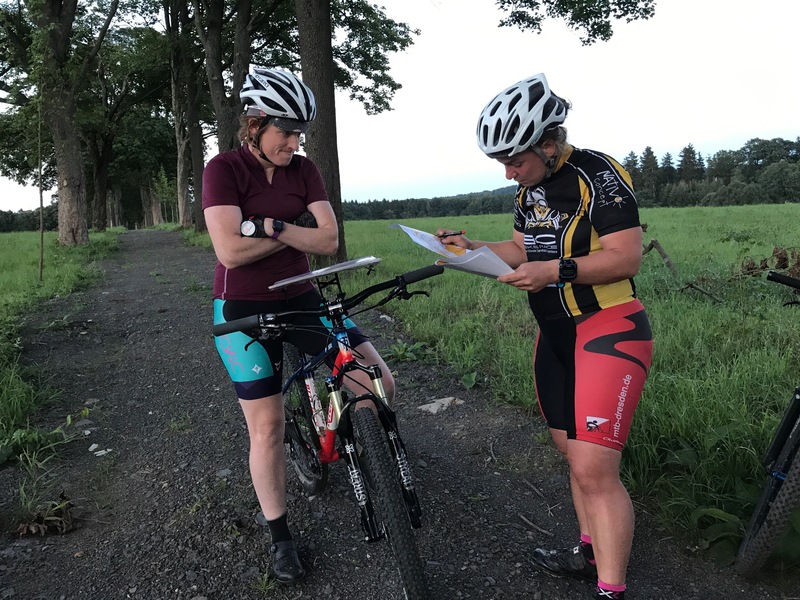 Sue and I had many split times with similarities, and both felt pretty strong on how smooth we could make route choices for the next control. 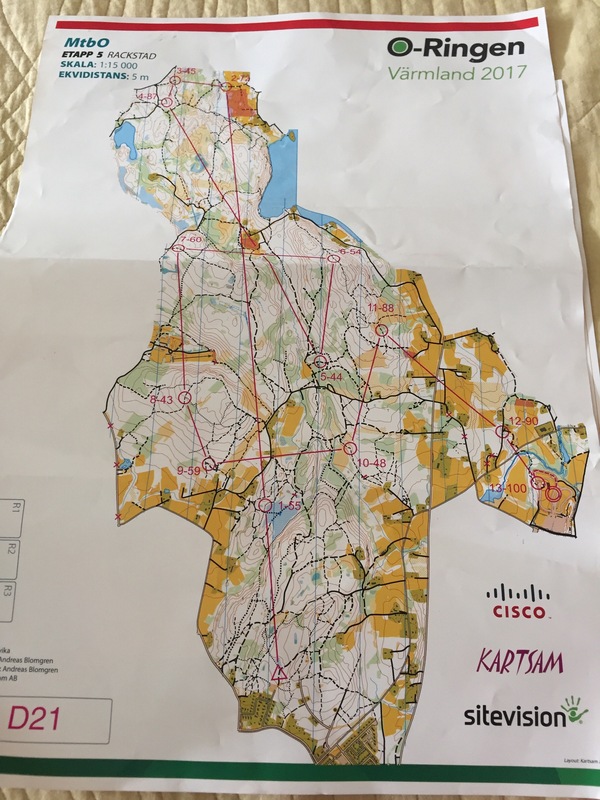 I think we each need to work on making map changes, and also on how to simplify our routes. This was also the first time either one of us came in under the 2 hour mark for a Long Distance! Hugs all around. 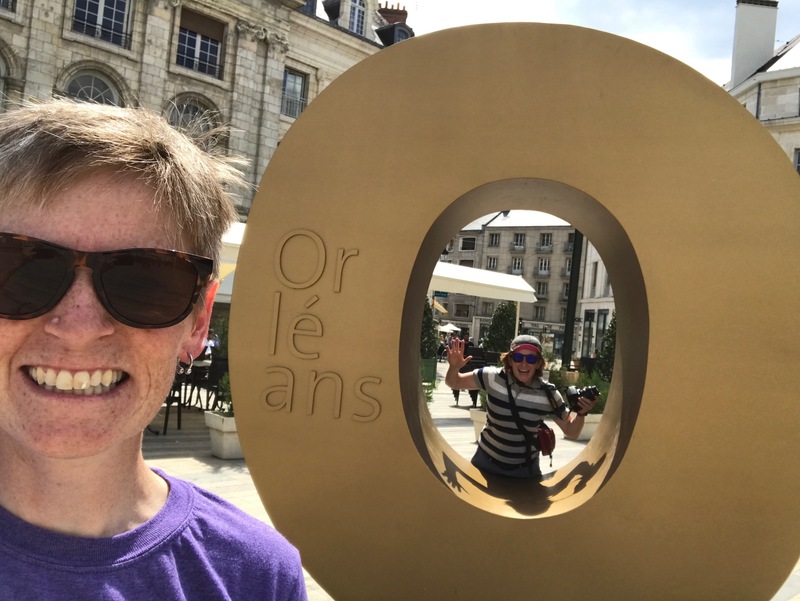 6) Did some more sightseeing around Orleans, one of the oldest cities in France. 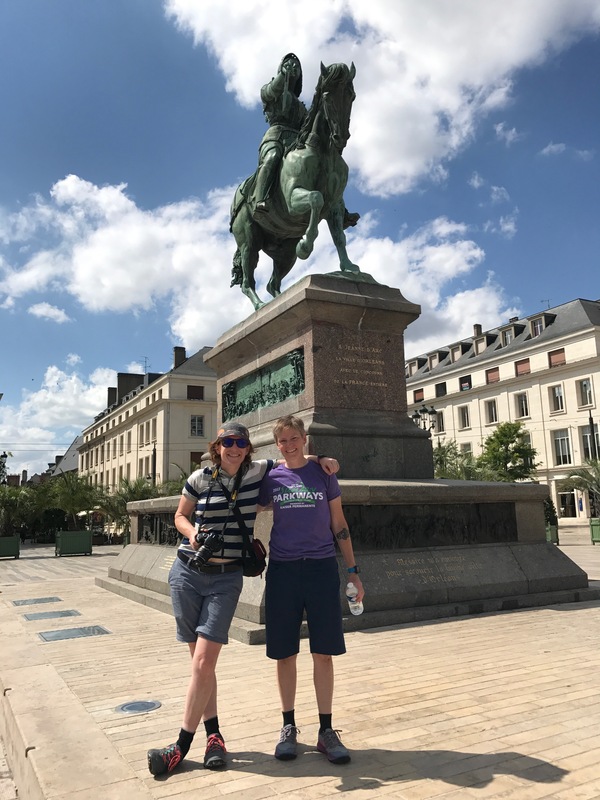 The city of Orleans was saved from English siege by Joan of Arc! They love her and hold an annual festival in her honor. Joan of Arc visited the cathedral below, and all of the stained glass windows inside depict her life. 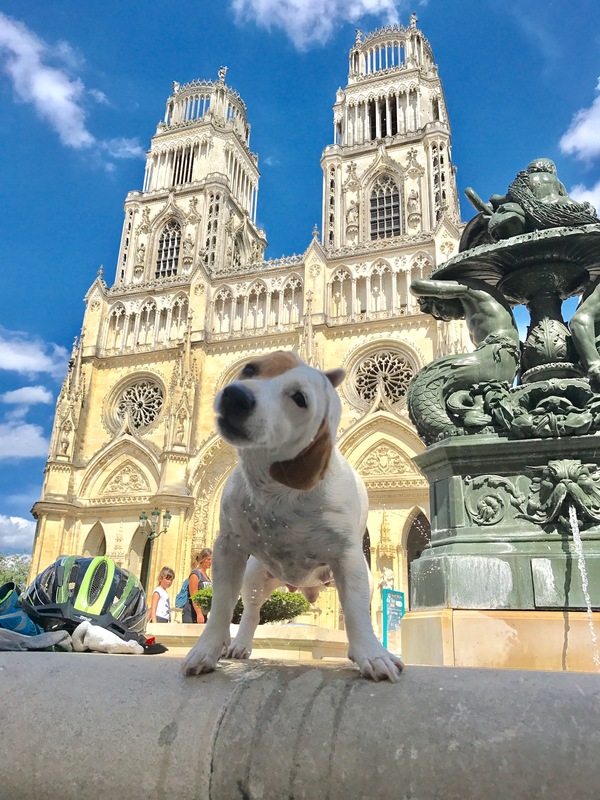 This puppy was visiting Orleans on a bike tour and stopped for Sue to snap a pic. 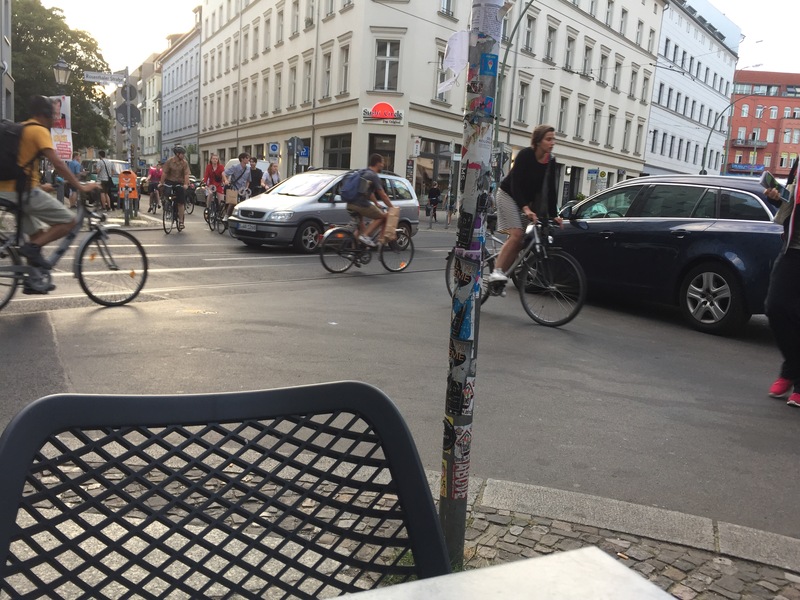 There are lots of bikes and bikeways. 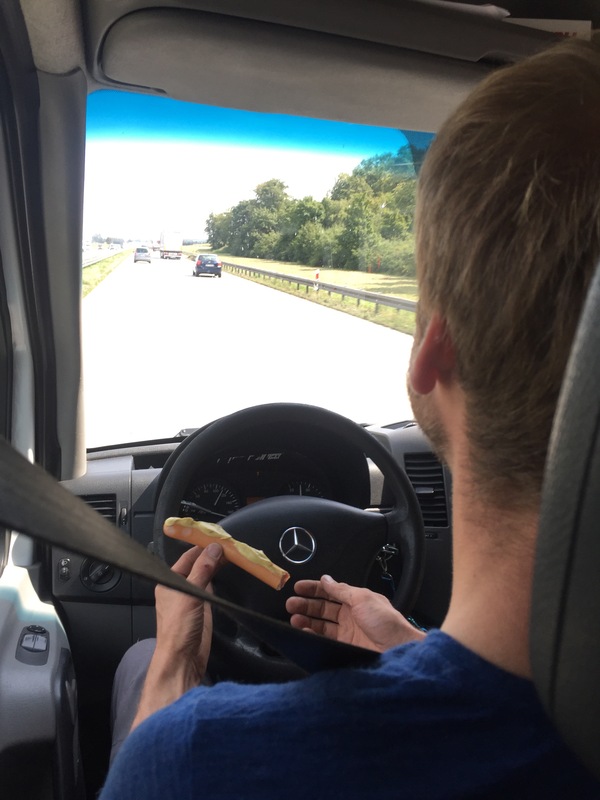 7) Drove to Dresden, Germany! Just another 11 hour car trip, no biggie. 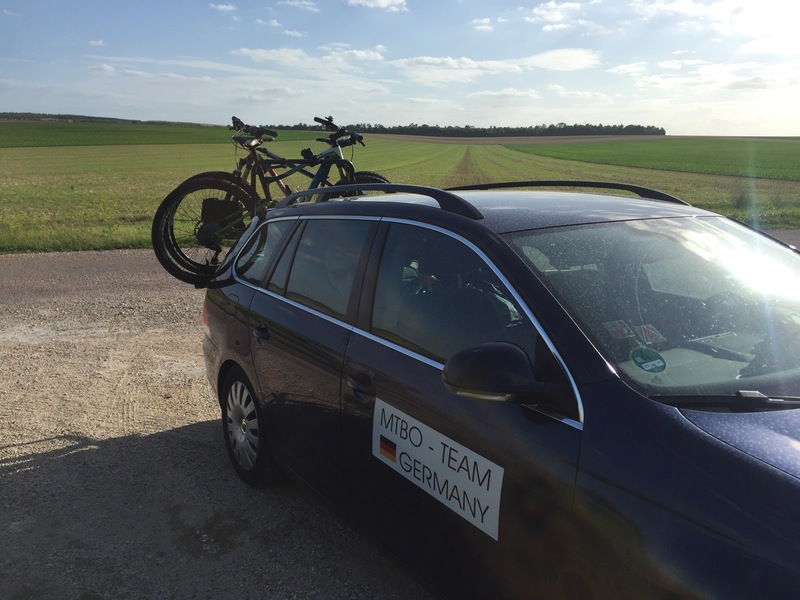 Anke from MTBO Deutschland visited us in Portland last December, and is now showing us around Eastern/Northern Germany! 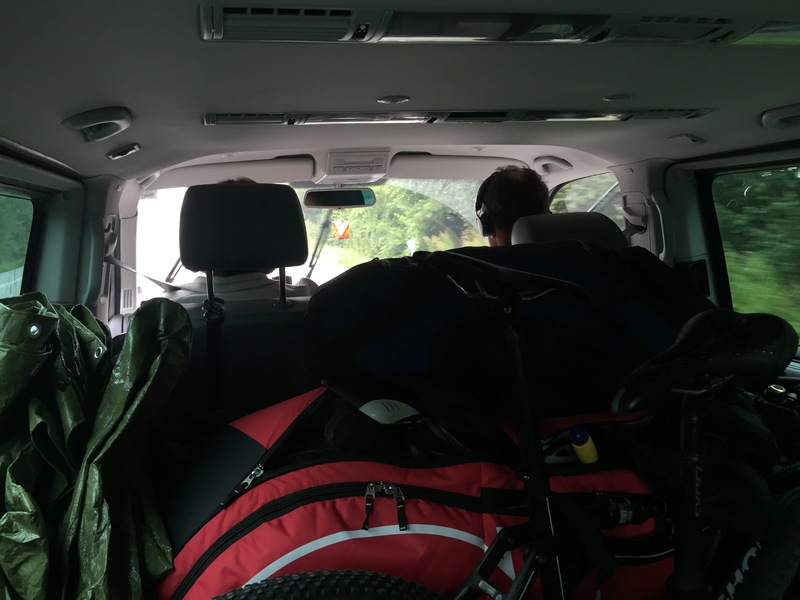 This car trip was equally as nuts as the drive from Sweden to France, just with one less person and a smaller car. 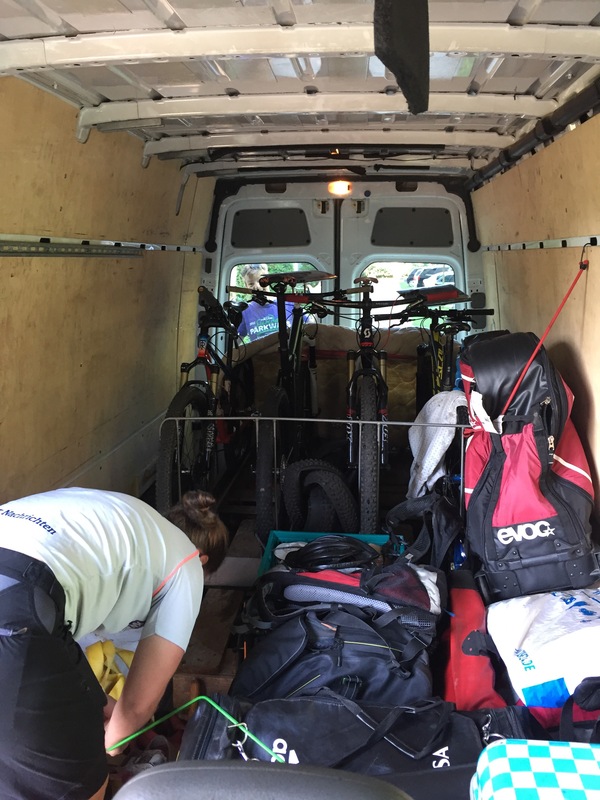 We rolled into Dresden around 3am after leaving the day of the Mixed Sprint Relay. 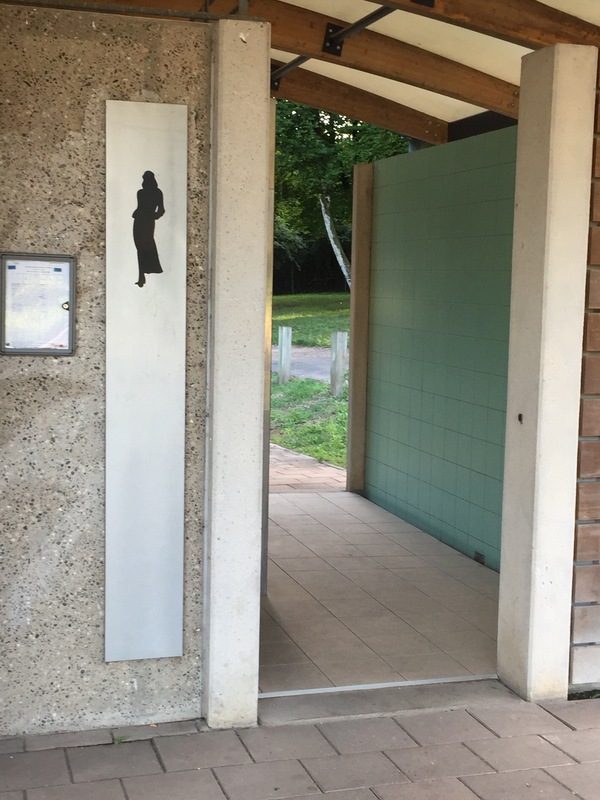 Only fancy ladies can use this French rest stop toilet pit. 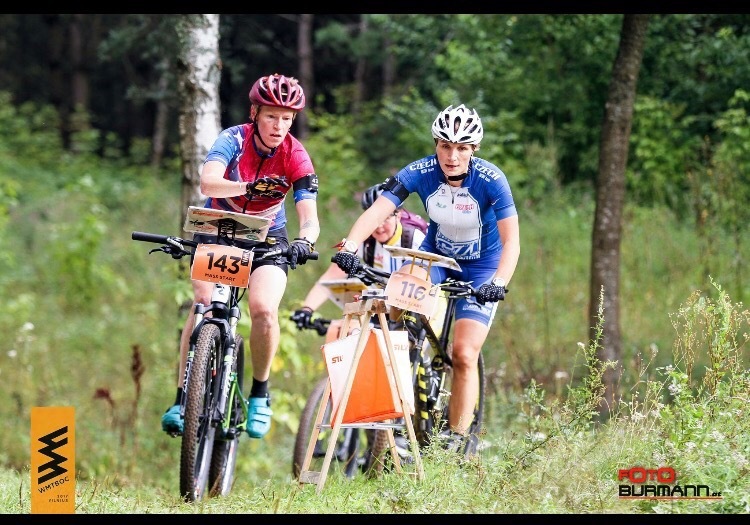 Anke has attended every MTBO World Champs since its inception, maybe 2001? 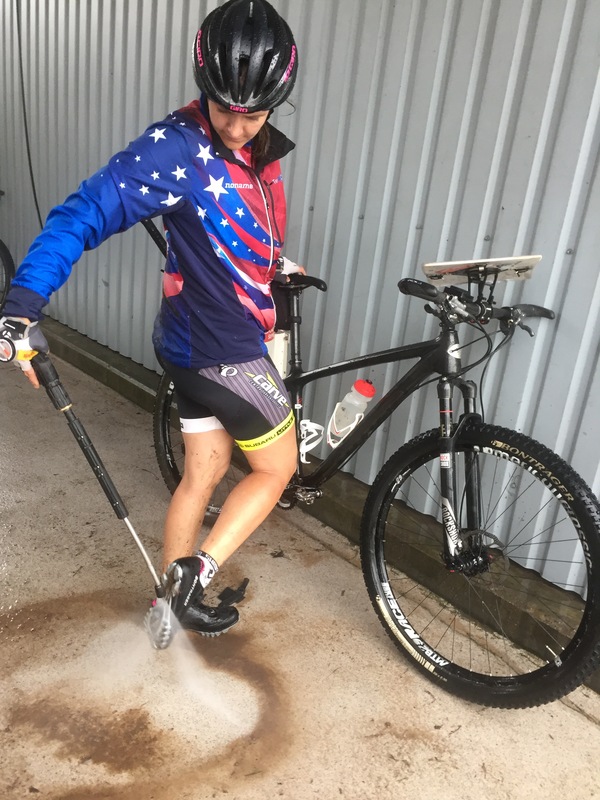 She hosts MTBO and Foot-O trainings in Kiel, where she lives in northern Germany. 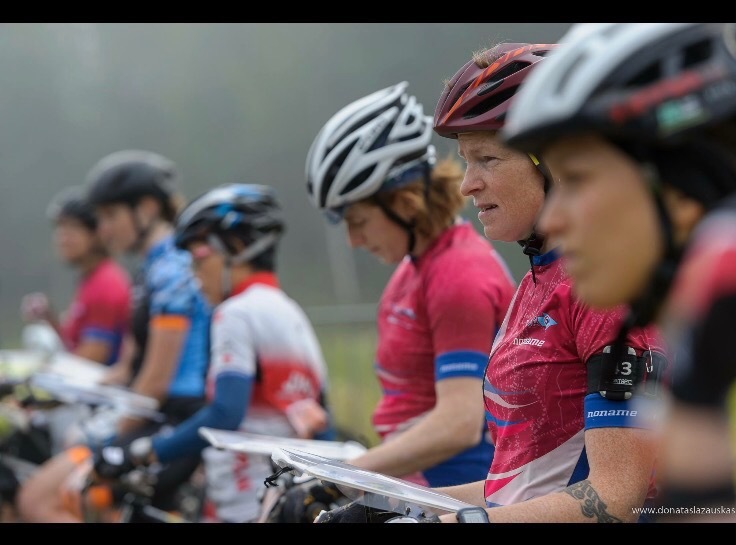 She knows way more about how to train for MTBO than we do, so we are soaking up all the knowledge she can offer. 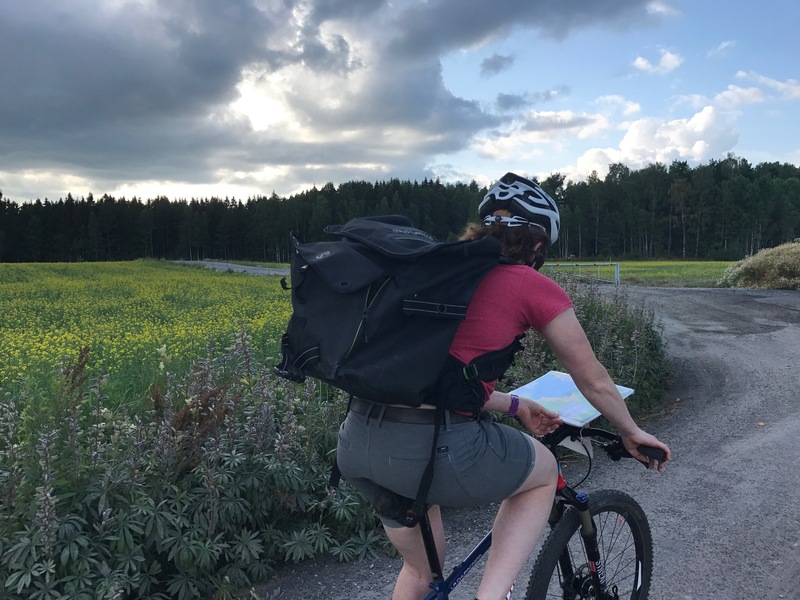 Talking route choice from one of our O-Ringen maps. Also eating store-bought Spaghetti Eis, one of my favorite treats from when I lived with a host family in southern Germany a la 1999. It’s ice cream pushed through a sieve that makes it look like spaghetti, then covered in strawberry “spaghetti sauce” and white chocolate “parmesan.” Delish! A late evening training on the Czech side of the border. I was afraid of running into wild pigs after learning there are a lot of them around due to many corn fields. We had to cut the training short due to darkness. Turns out there was also a lunar eclipse the same night ! It may be a little challenging to see. 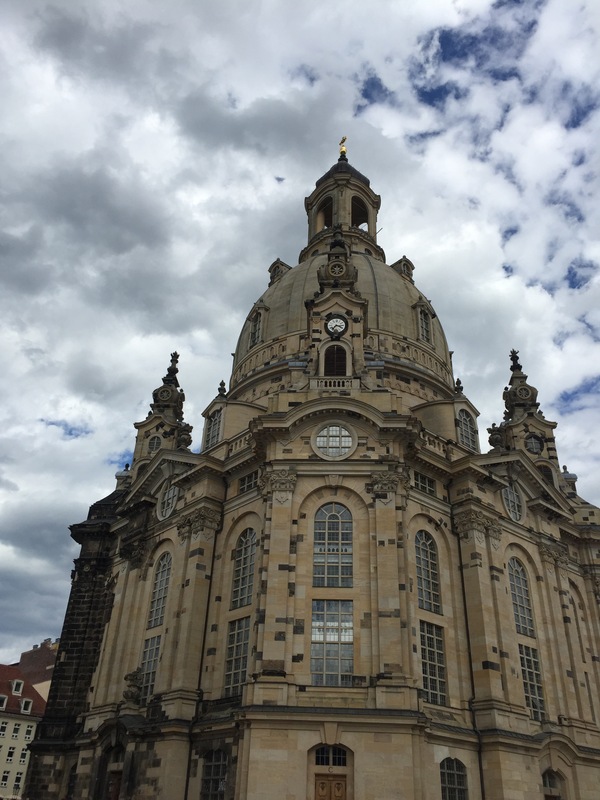 9) Visiting Dresden – a city made for giants! 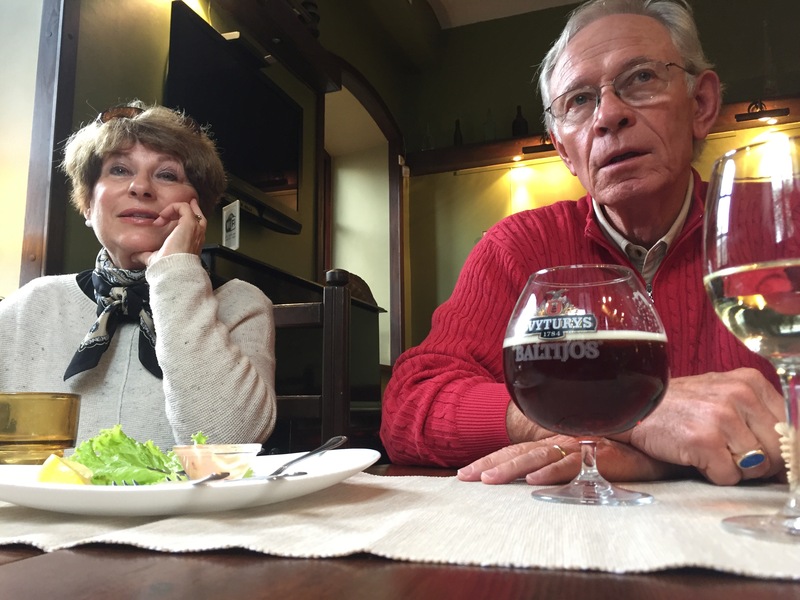 Neither Sue nor I had too much knowledge about Dresden, which made it a really great surprise. 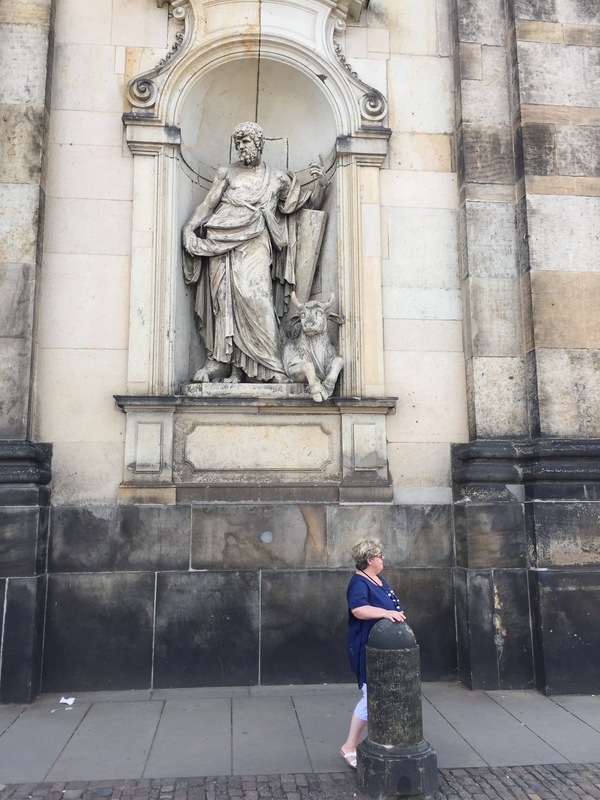 It’s a glorious city with many of the older buildings built from sandstone in the nearby Elbe Sandstone Mountains, or Elbsandsteingebirge. Many of the older buildings are starting to turn dark, which is apparently a natural happening, not because of environmental impacts. 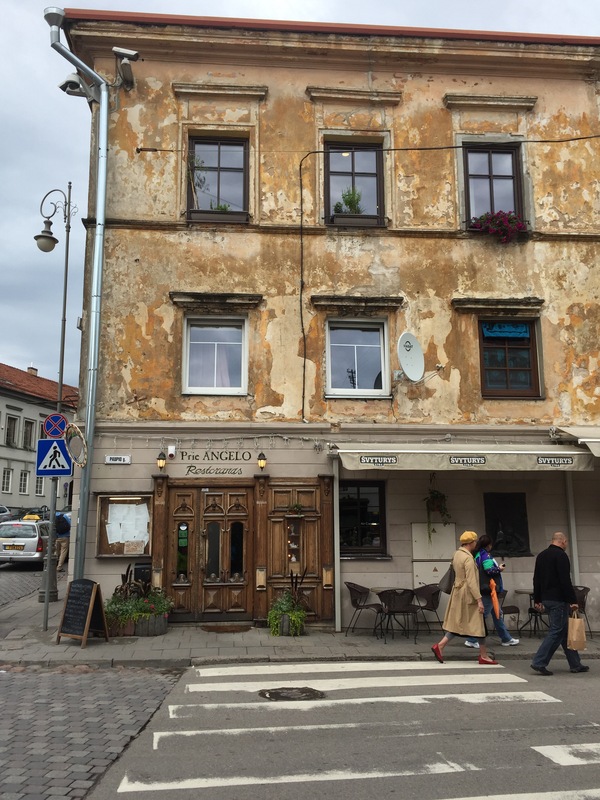 Everything in the old town felt enormous, perhaps because of the large blocks of sandstone. Tile work that absolutely looks like a tapestry. Showcasing all the former leaders. Where are the women?! 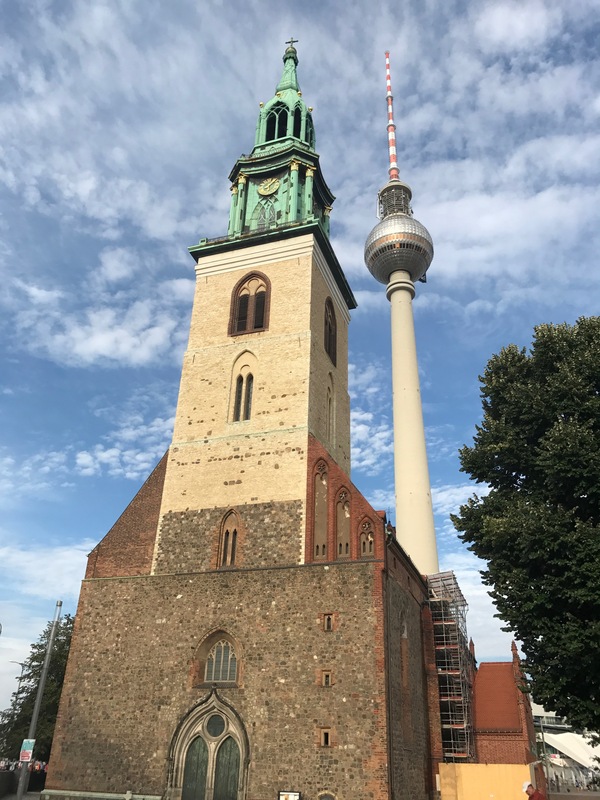 The Frauenkirche was mostly destroyed during WWII but entirely rebuilt in its original fashion. It was only finished being rebuilt about 10 years ago. All the dark spots show the aging sandstone. We are learning so much about East Germany. 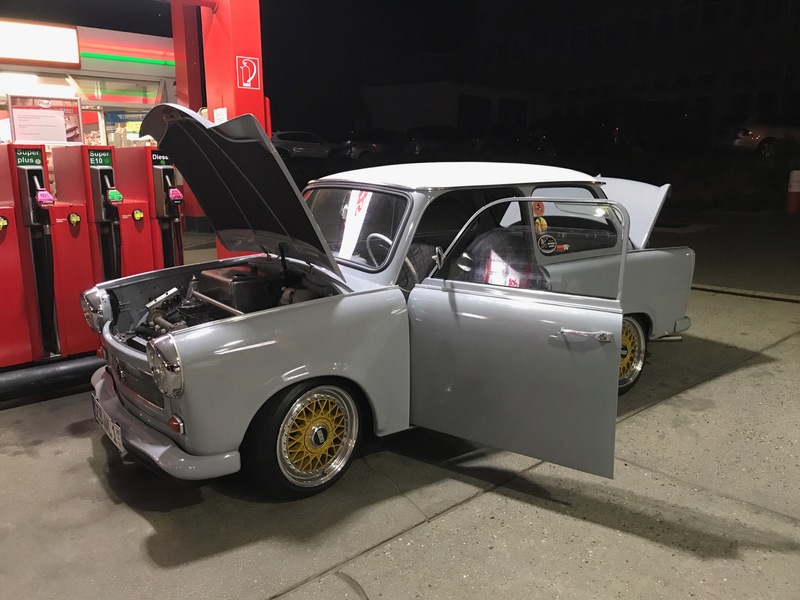 Anke helped us spot this Trabant vehicle at a gas station near the Czech border. Trabant’s were one of five brands of automobiles available in East Germany while the Iron Curtain was still intact. When the wall fell there was a “Trabi Trail” of East Germans relocating to the West, where they abandoned their Trabants for more reliable cars built in the west. Move over, REI. 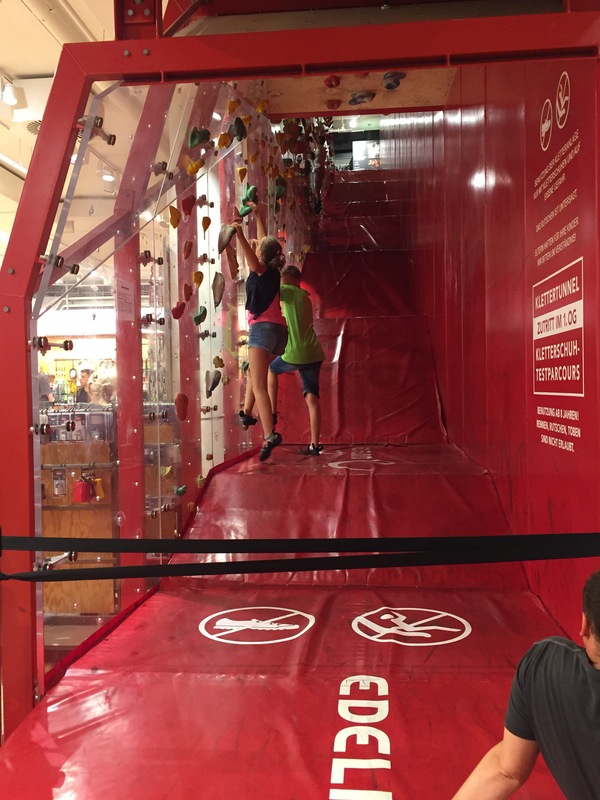 German sports store, Globetrotter, is way better. 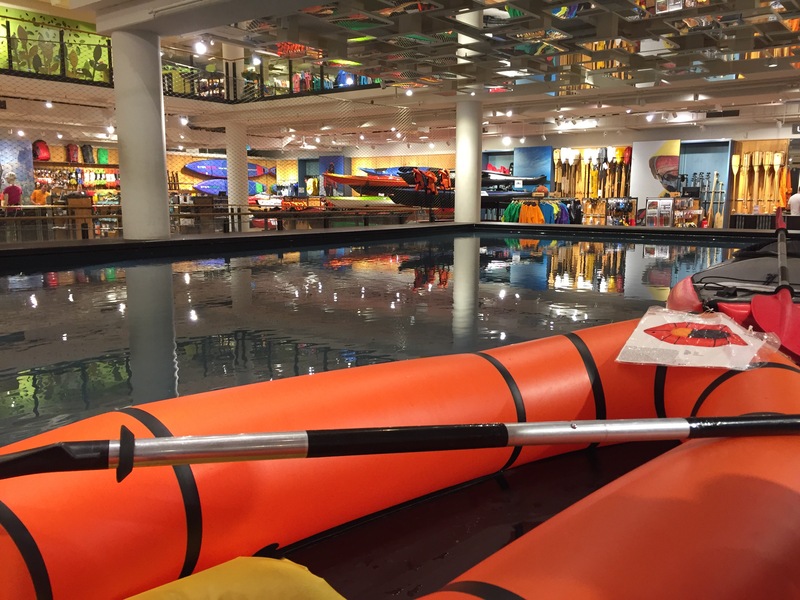 Below are photos of their second floor kayak testing pool and the kids climbing area built under the stairs. So fancy! It’s just so pretty here! 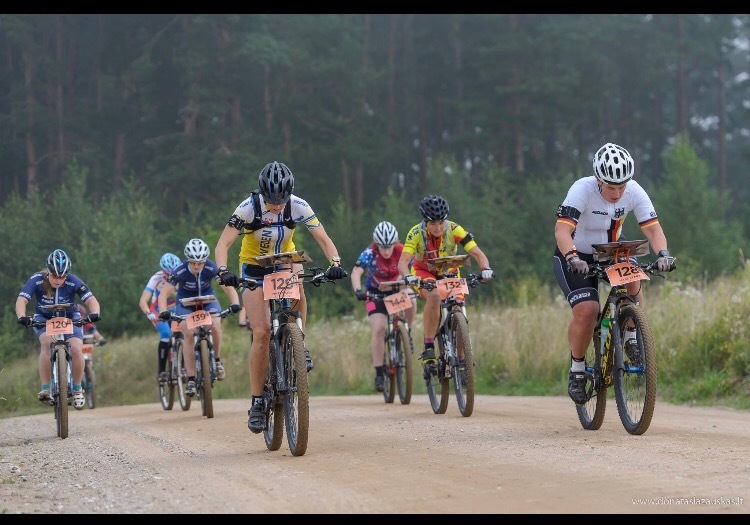 Anke raced in a 40k mountain bike race (the Erzgebirgs Bike Marathon) this past Sunday, and the surroundings were glorious. 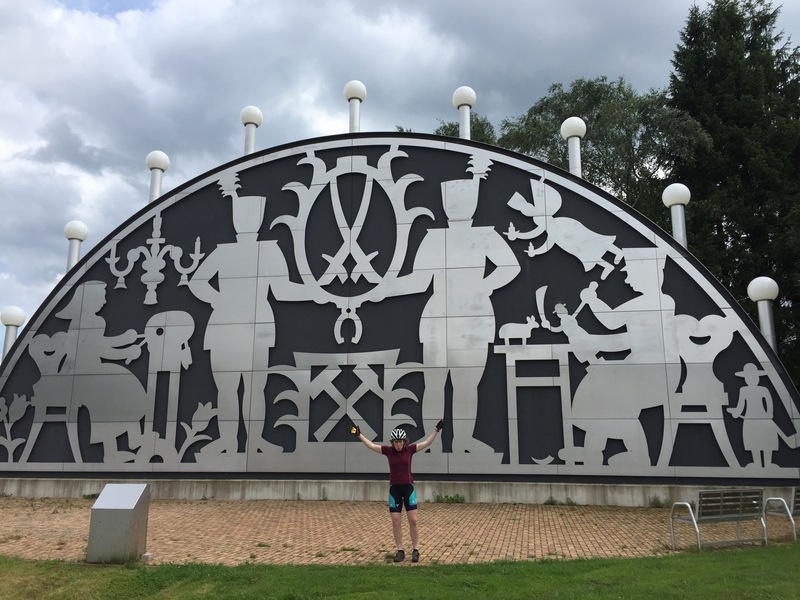 We were again on the Czech border, where many Erzgebirge Weihnachtspyramide (Christmas pyramids) and other fine wood crafts are made, including this huge one! 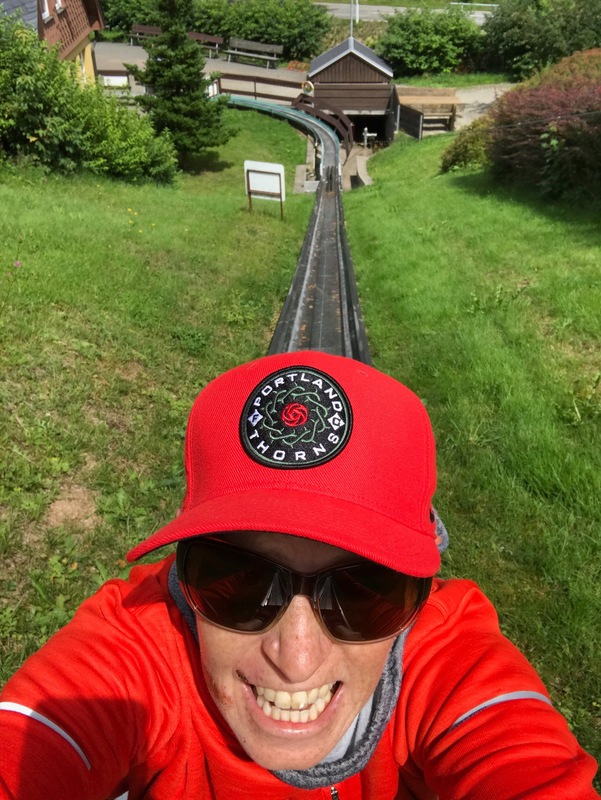 There should be more alpine slides in the world! Always bringing joy. 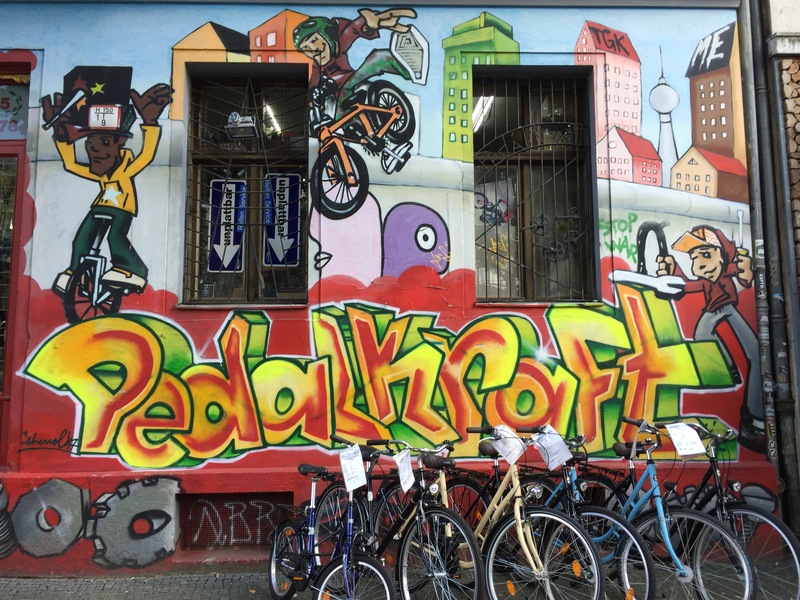 Today we landed in Berlin for a little poking around and seeing some sights, then it’s off to Kiel to revisit Anke and delve into some more MTBO training. 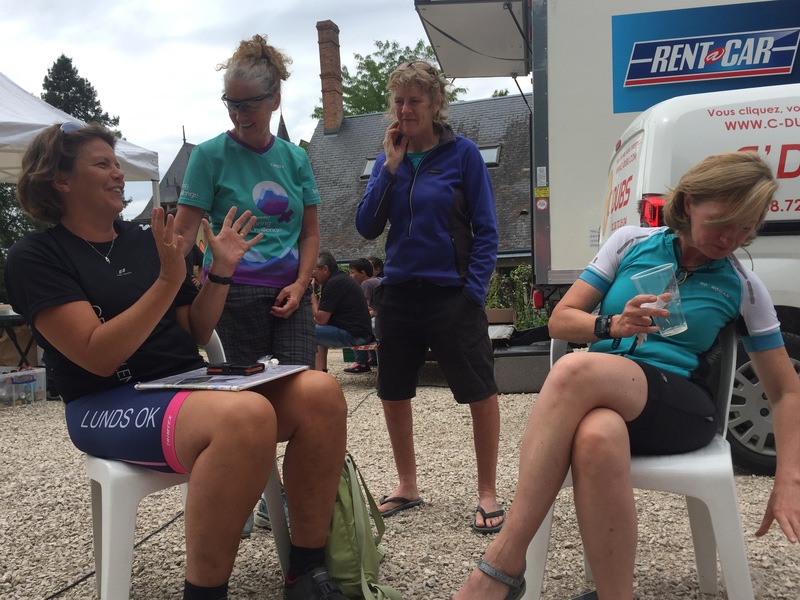 Sue is also recovering from a crash during the Mixed Sprint Relay back in France. She took a slight dip into a ditch and the ditch may have won. 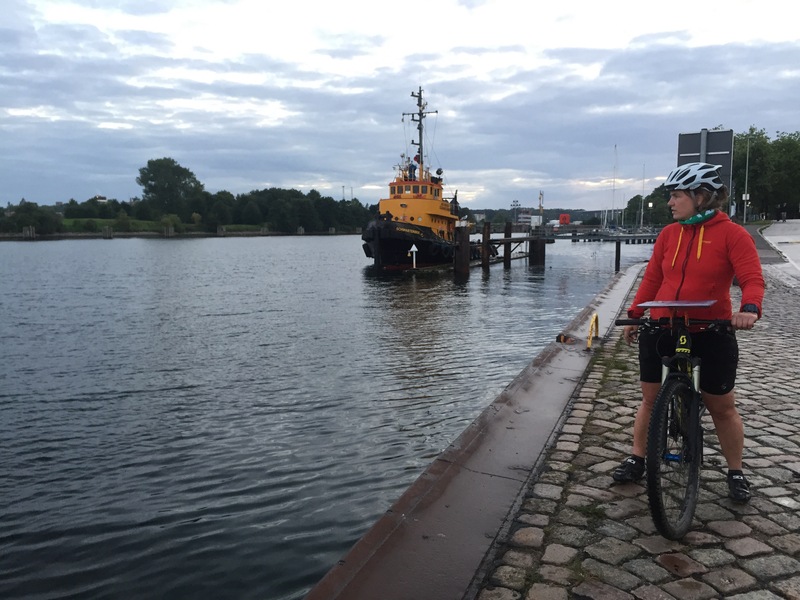 She is taking a few days off the bike and will be ready to roll again in Kiel. 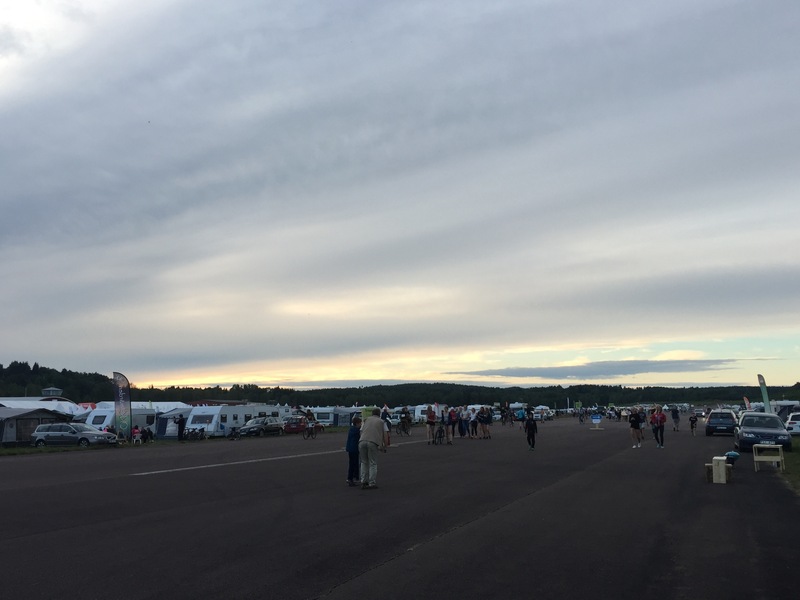 Let’s take it back a few days to the night before we left Arvika. 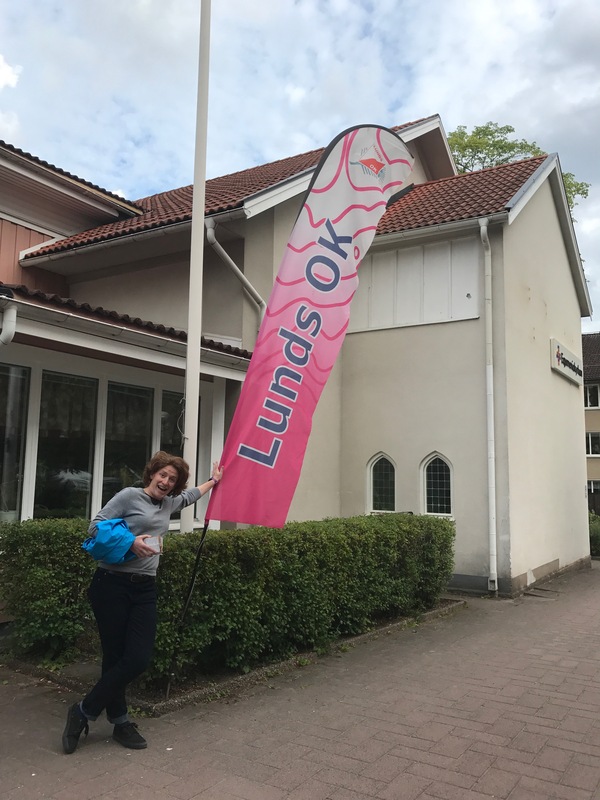 Malin and her Lunds OK club invited us to their fika event on Thursday, which included a delicious pear crisp and coffee or tea. 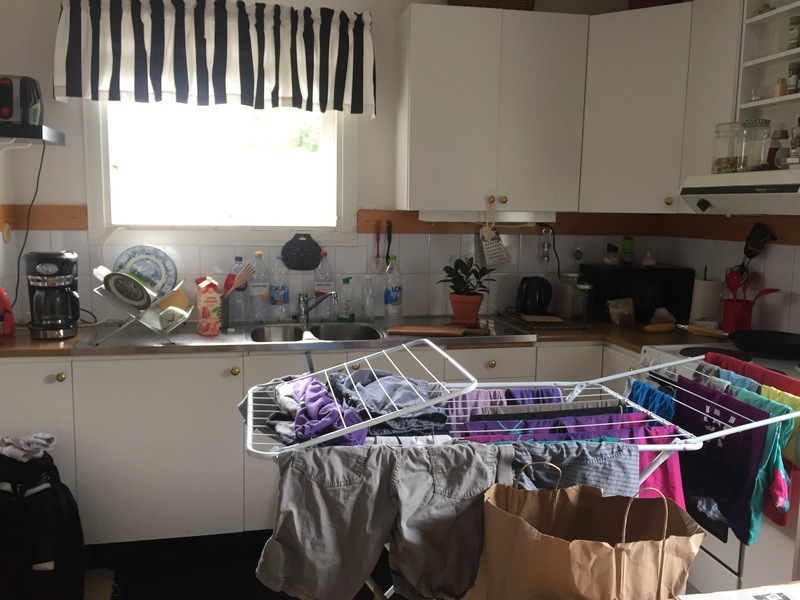 A large number of people from their club stayed at a school in central Arvika, sleeping on inflatable mattresses in the gym, and using giant industrial dish washers to clean up from their group dinners. 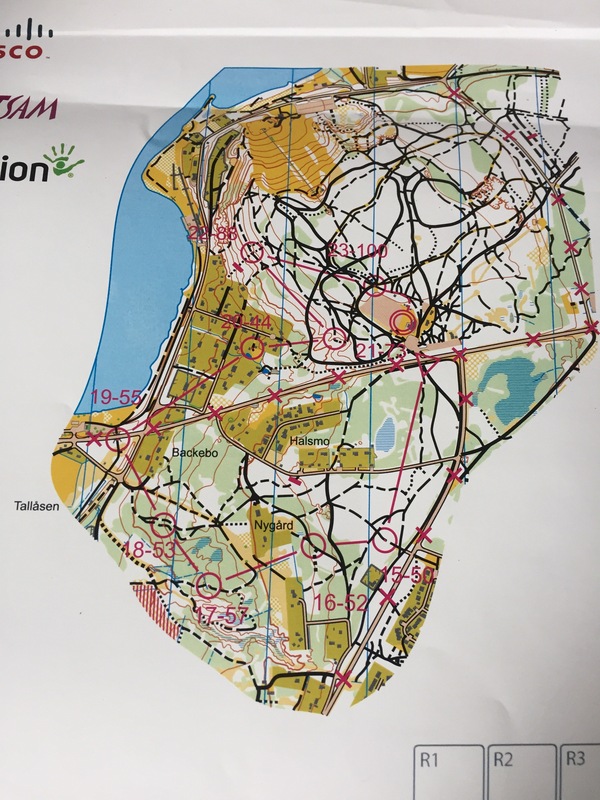 We learned from Malin that one of their club members is an excellent orienteer and also just happens to sit on the Nobel Peace Prize Selection Committee. You know, how you do. 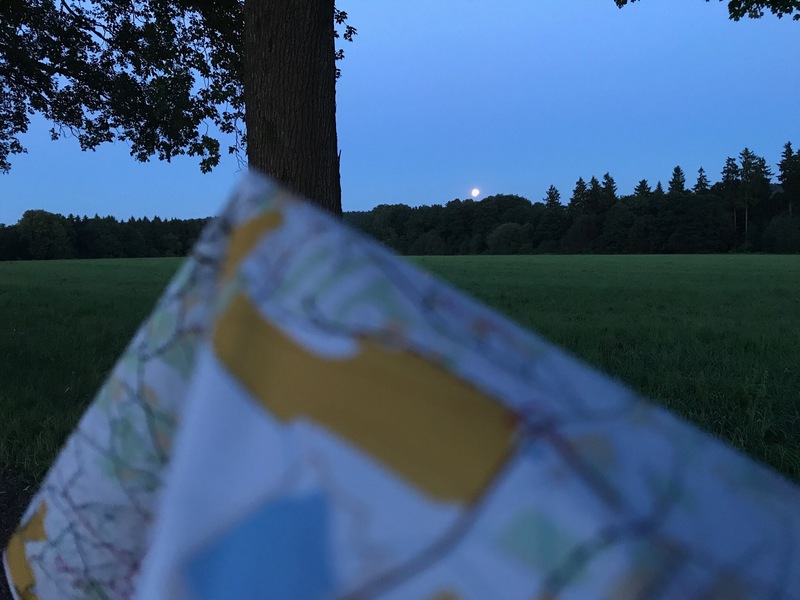 Here’s a photo of me outside with their club flag, and also some of their club members discussing route choices from the day’s middle distance event. 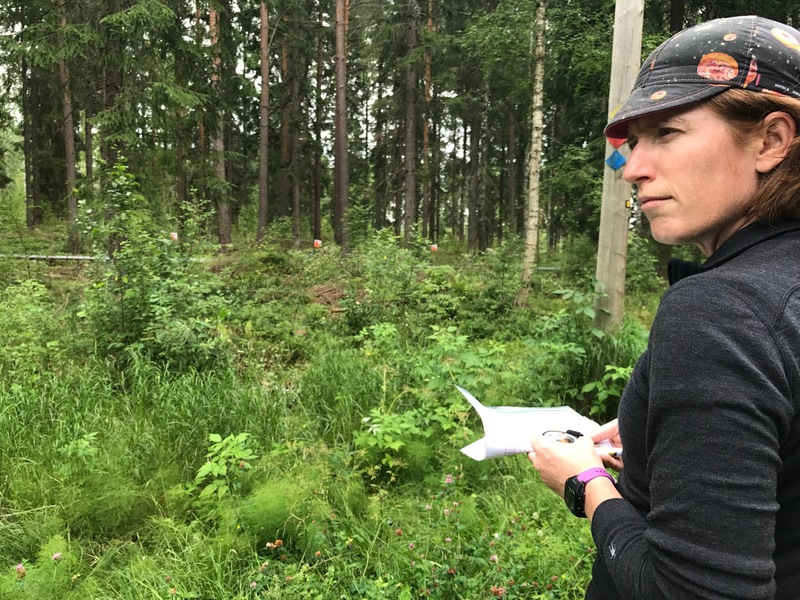 We noticed that many foot orienteers who hadn’t tried MTBO seemed to be intimidated by the idea of orienteering by bike. 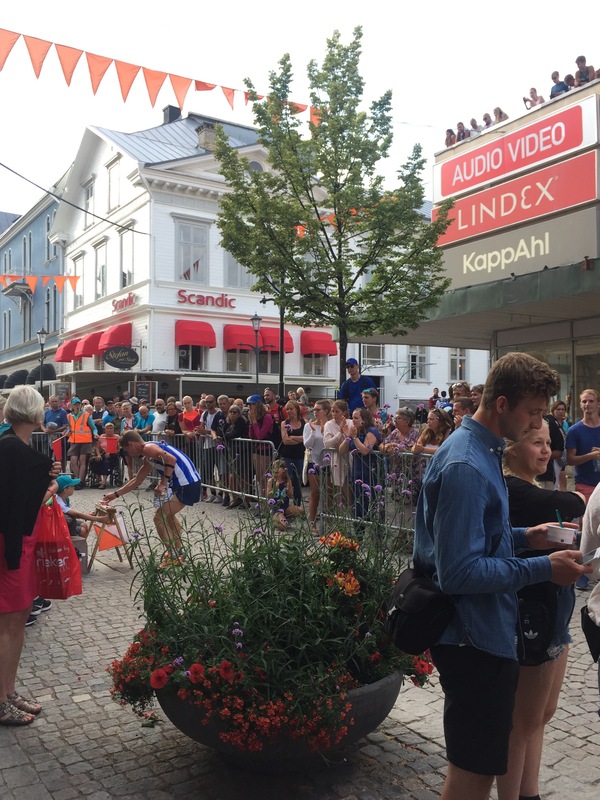 We have felt really welcomed by the Lund crowd, and have very much appreciated their hospitality. 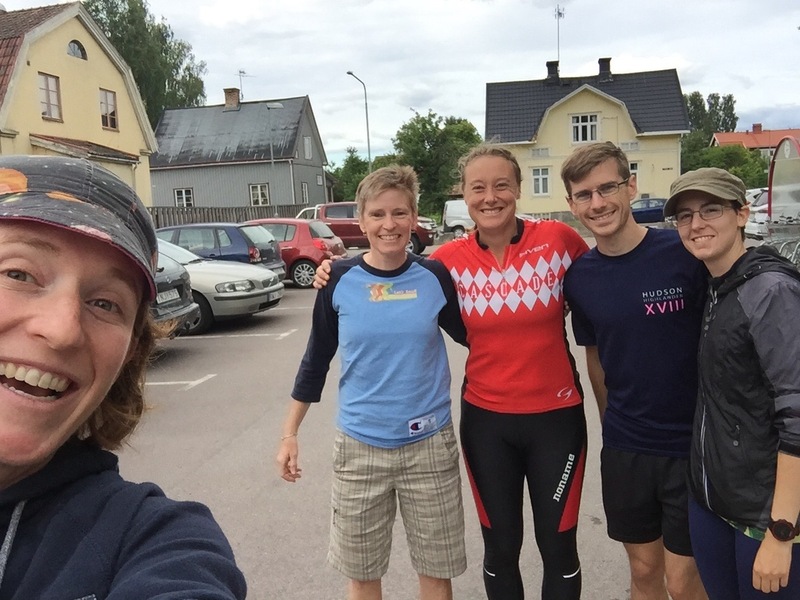 It’s been really fun making new friends and seeing how Swedish orienteering clubs roll. FRIDAY, Last day of O-Ringen! Our Long Distance was a culmination of the week’s races. 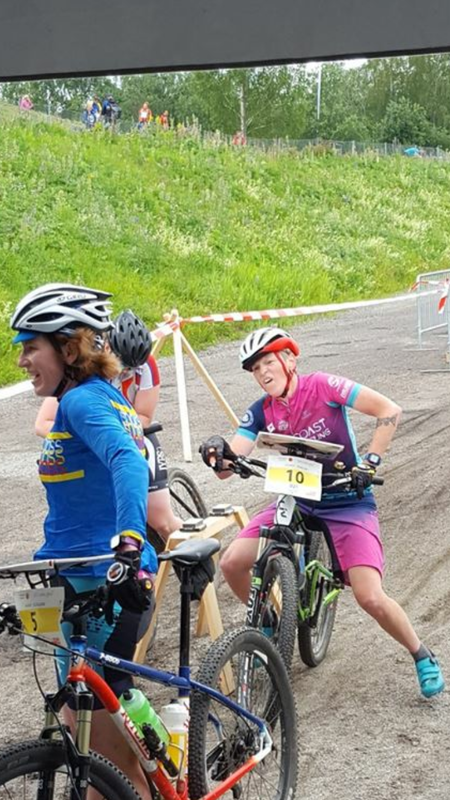 Technically a pursuit race in which the person with the fastest overall time starts first either with confidence they won’t be caught or stress that the bloodthirsty riders behind them will hunt them down on the course. 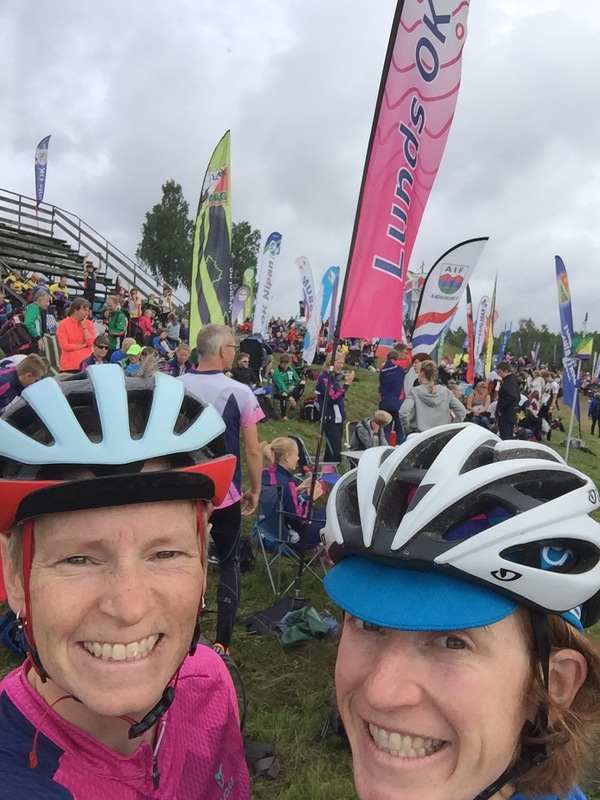 I started 5 minutes before Sue and sadly we ran into each other around control six after both making some major baubles and also after I collided with another rider on a skinny track between controls two and three. 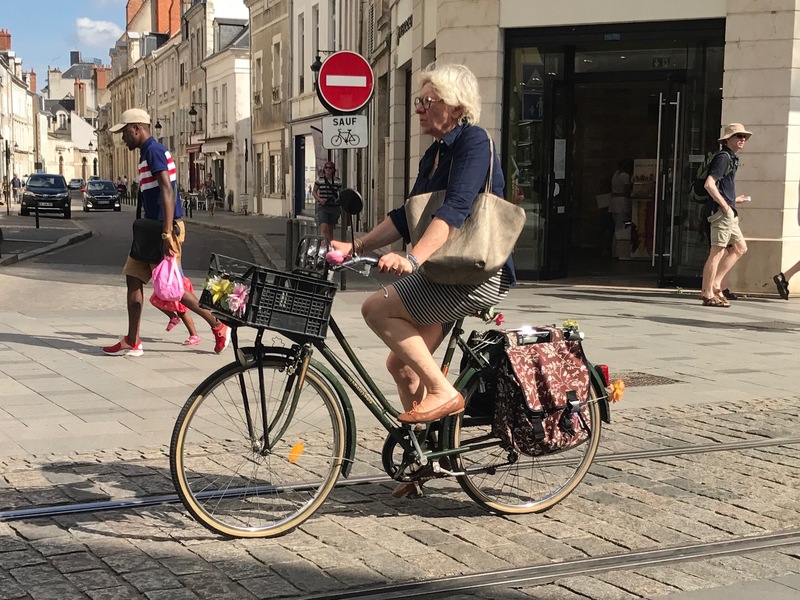 The other guy and I were mostly just shaken up, but I did have to straighten out my handlebars because they’d been twisted out of whack. The next 32 hours included driving to Lund with Peter to sleep at his house, eating too many gummies, stopping to eat at a Laxbutiken roadside restaurant with insanely good salmon, seeing views of Sweden’s farmland from the car, taking a ferry from Sweden to Denmark, driving through Germany (rainy), The Netherlands (sunny), Belgium (amazing people watching at the gas station), getting in and out of the car trying not to disturb the bikes, and missing a turn in the dark of night in France and having to go at least 30 minutes out of our way at 1:00 am! Phew! 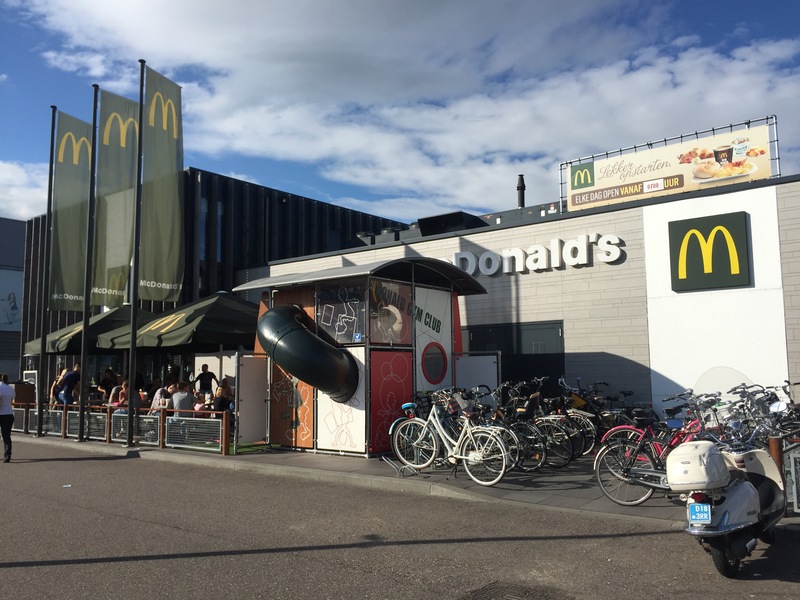 Here is a photo of the Swedish countryside and a McDonald’s in The Netherlands where biking to the restaurant is a common thing to do. 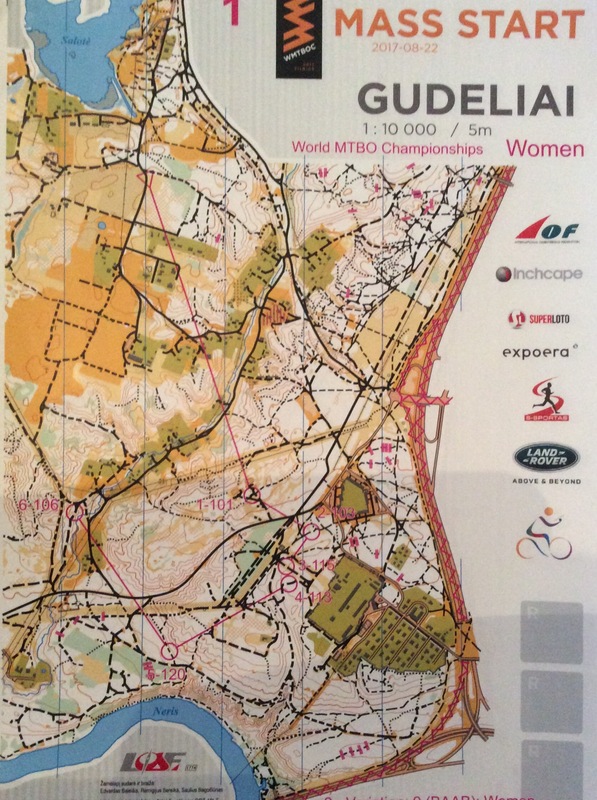 Today (Sunday), is our first full day in France, and included the Sprint race for the French World Cup. We’ll share more about that in a second post. For now, au revoir! Here is Abra trying out Precision-O (Trail-O). If you look closely you can see 3 control bags in the forest. 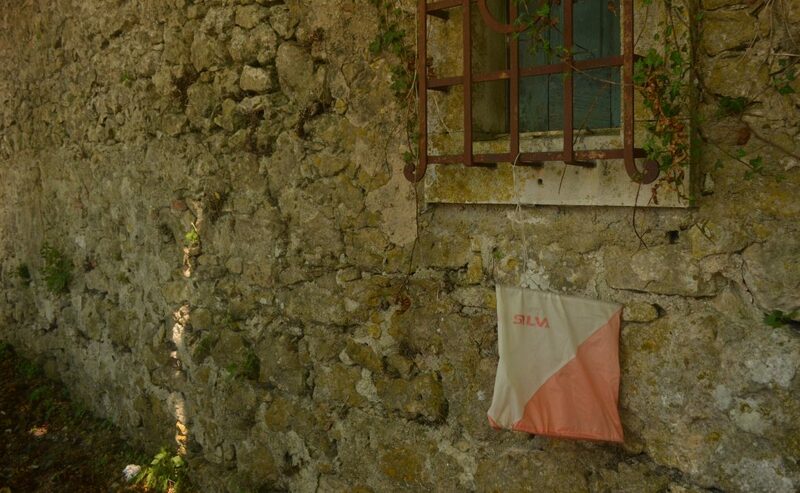 The challenge is to select the correct bag according the map you have based on the control description and the detail of the map. This is not an easy task and it may have hurt our brains a little, especially for being a rest day. I had to take a nap when we got back to our apartment! This discipline is really good training for fine tuning your skills. 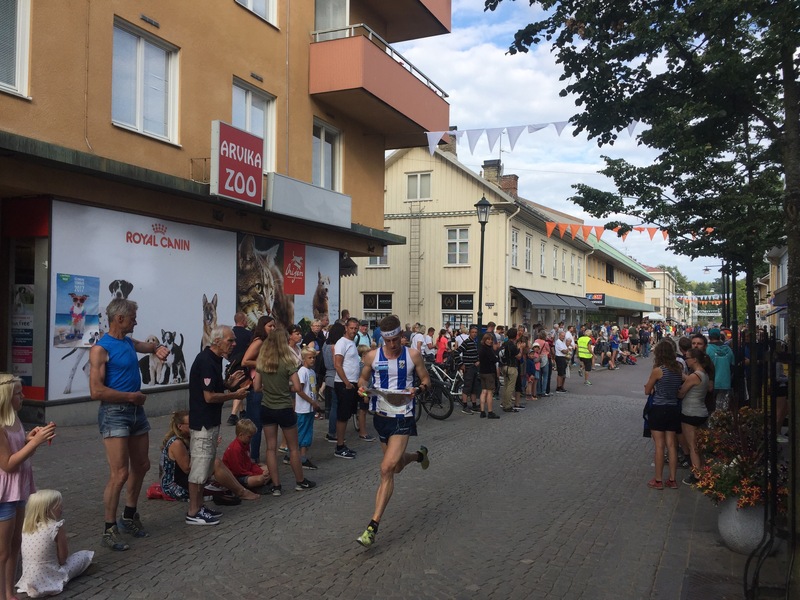 After my nap, it was time to go catch a few minutes of the Elite Urban Sprint that was held in the city center of Arvika. Once again, crowds of spectators making it a fun scene to be a part of. And now back to racing!!! 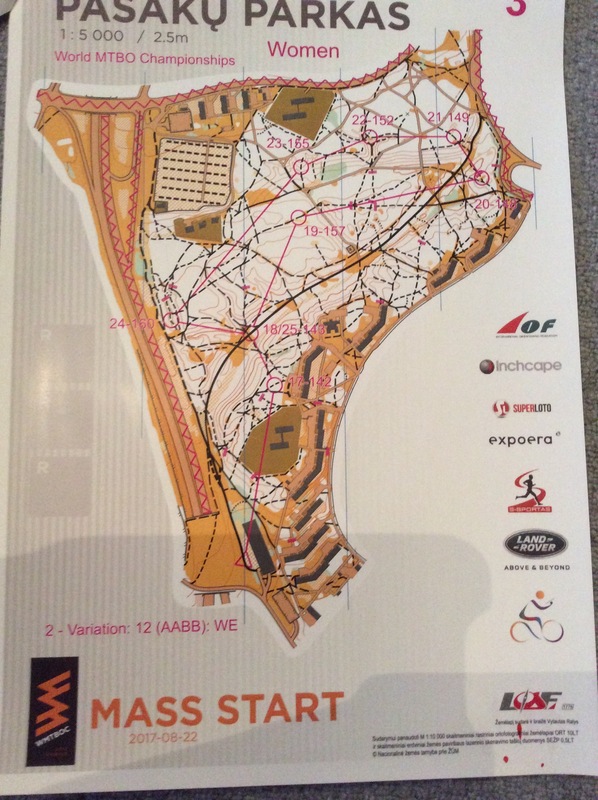 It was a Sprint distance on Wednesday – super challenging and sadly I missed control #11 so I was disqualified. Take a look at this map and maybe you will understand why I missed a control. Here is a picture of Abra punching in at the last “Go” control. 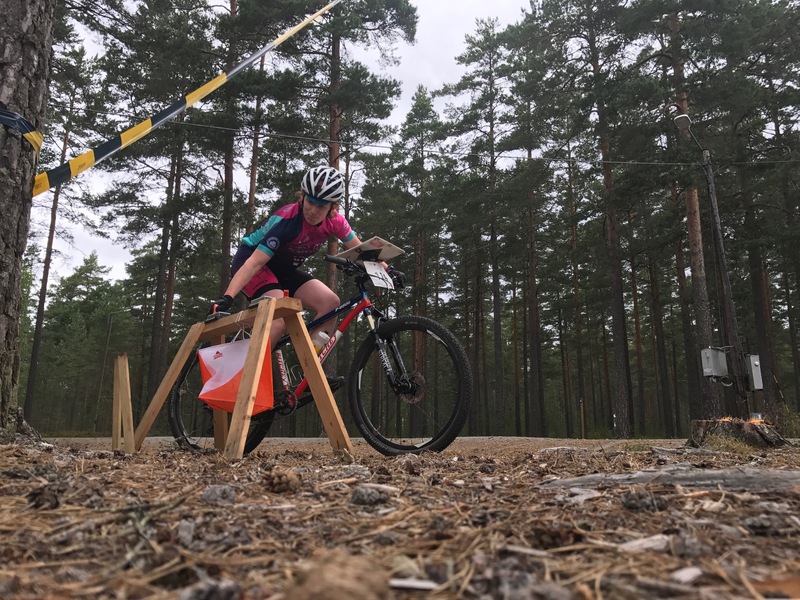 And a young MTBO athlete, Embla, from Sweden. Her mom painted her nails for O-Ringen week! Back to the apartment and time to figure out how to use the laundry. 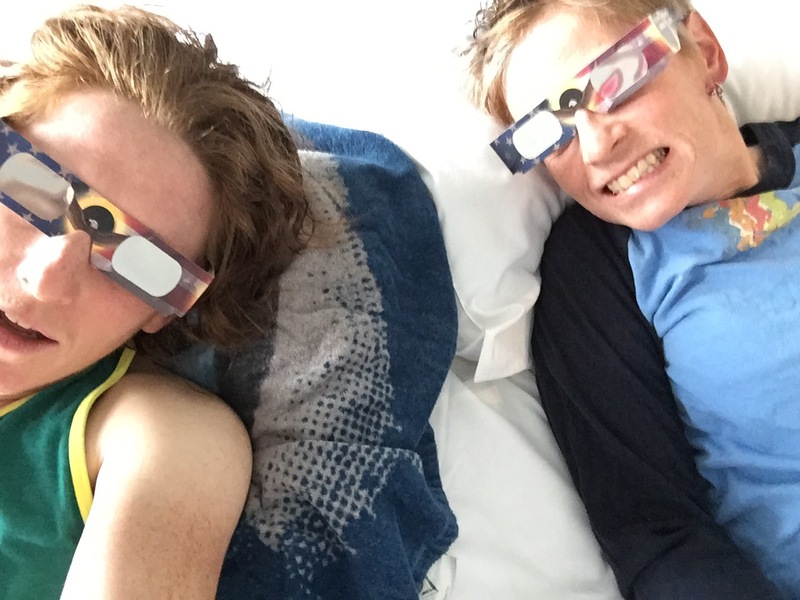 We had to use the Googles to translate some of the settings. 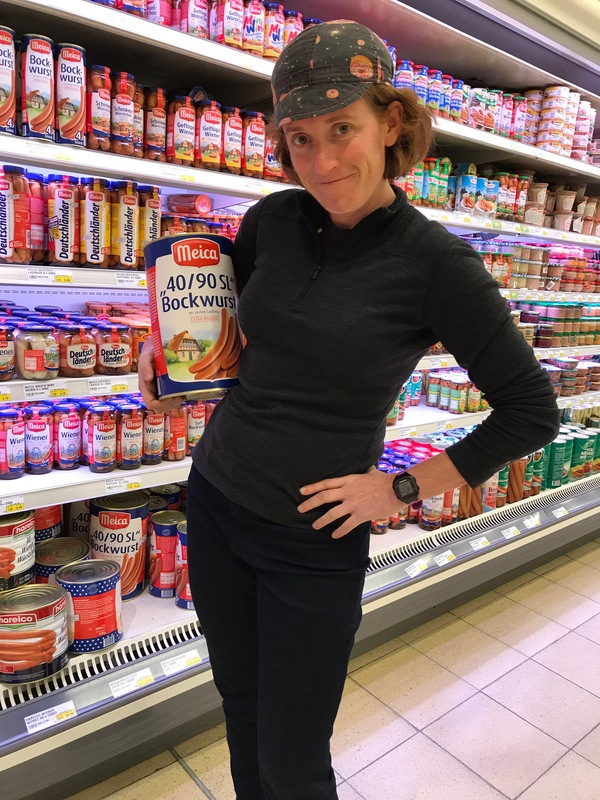 No lycra melted and things smell clean – WIN!!! 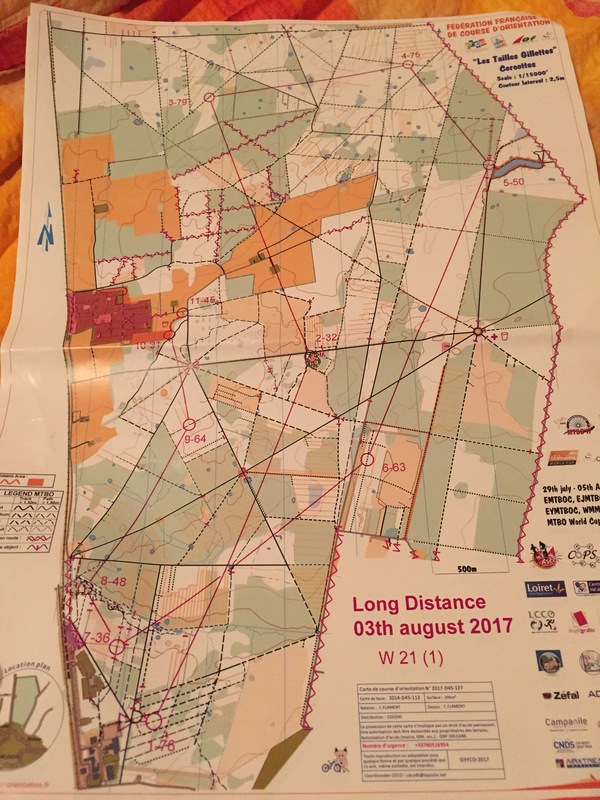 Day 4 – Another Middle Distance race. It was back at the same area as the Sprint and the same crazy web of trails. Can’t say either one of us had stellar races but that’s orienteering, it’s mental. You have to learn from your mistakes and move on. Here is the map, it’s 2 sides. 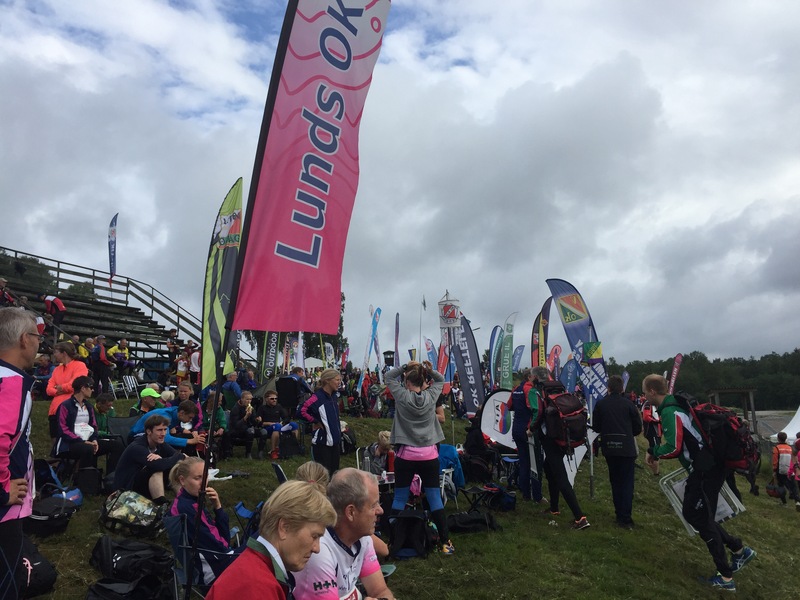 Yesterday’s Middle Distance race was held at a nordic ski area in Sunne. 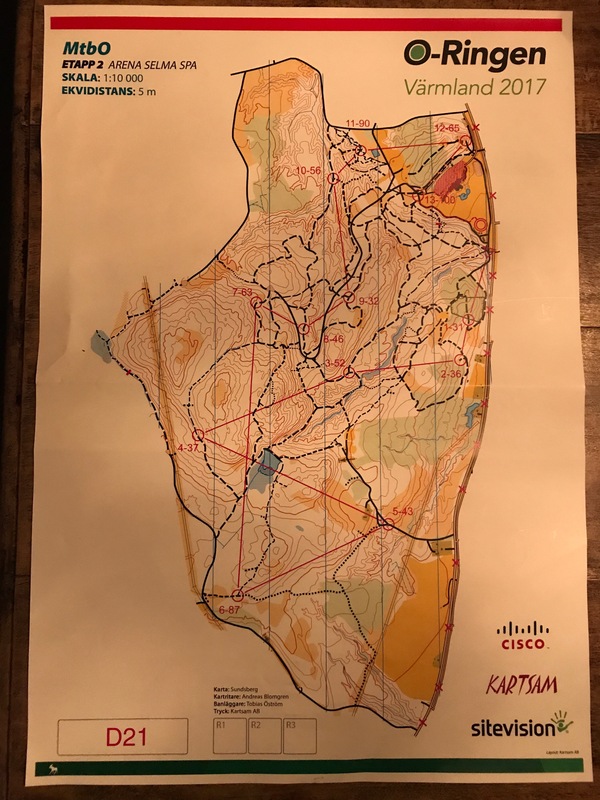 The course was around 8 miles with a fair amount of climbing and fun descents. 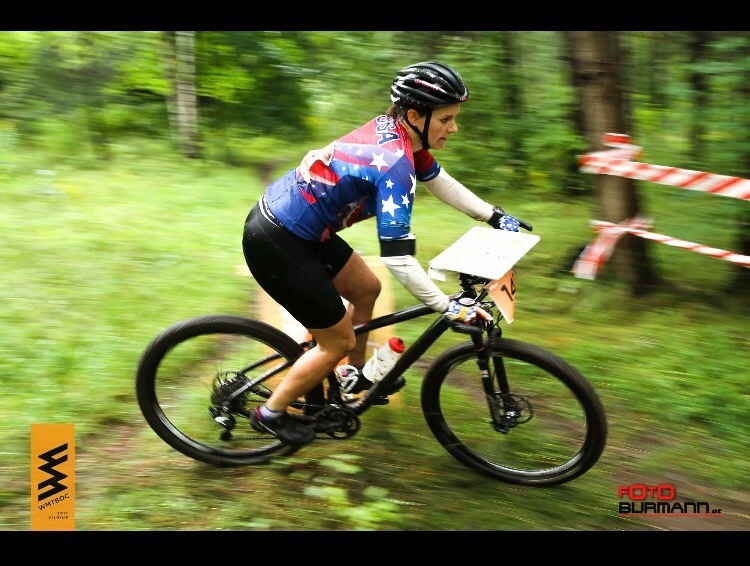 Sue came out of the day with a third place ride, sneaking by 4th place in just under a minute. Awesome! I had a 5th place finish, just about a minute and a half-ish behind Sue. 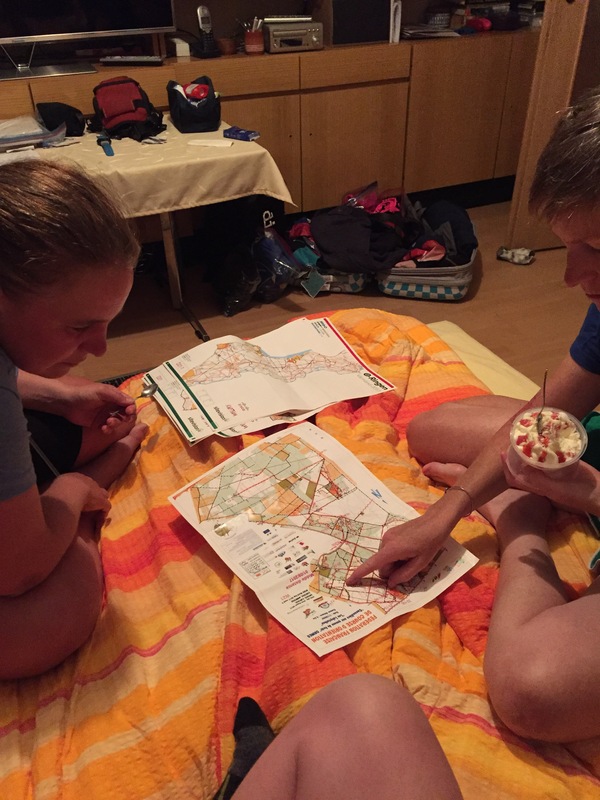 Comparing route choices afterwards was pretty fun, as we each made a number of different decisions on the course. One had me arriving at a control just one second slower than Sue, and another lost me 1.5 minutes! We are both feeling better about getting into the map and are looking forward to more races the rest of this week. Here’s a peak at yesterday’s map (in a nice, low-lit photo), plus some other photos from the day. Below you can see a large ski lodge/spa/hotel in the background. The day turned out to be gorgeous despite earlier weather reports calling for rain. Everyone hung out on the lawn waiting for their start times to come up. 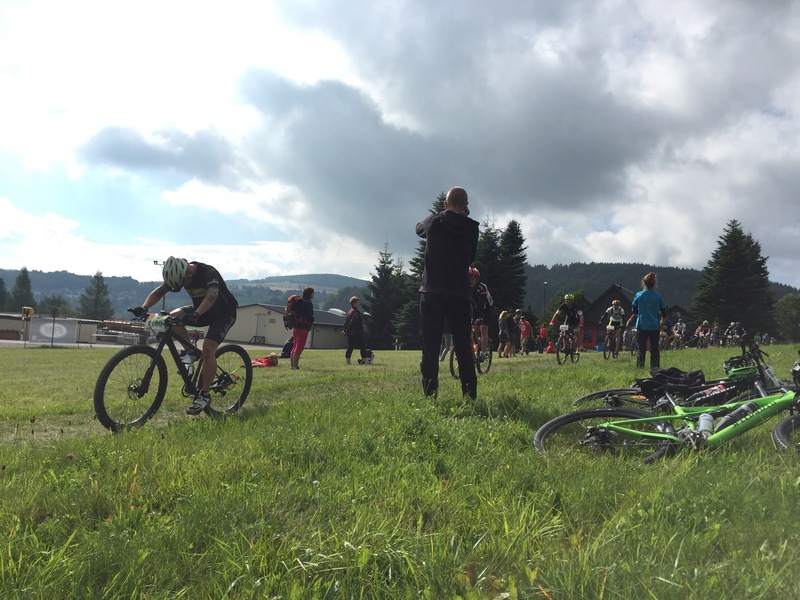 Each day has been quite a big production, with an announcer and lots of volunteers. 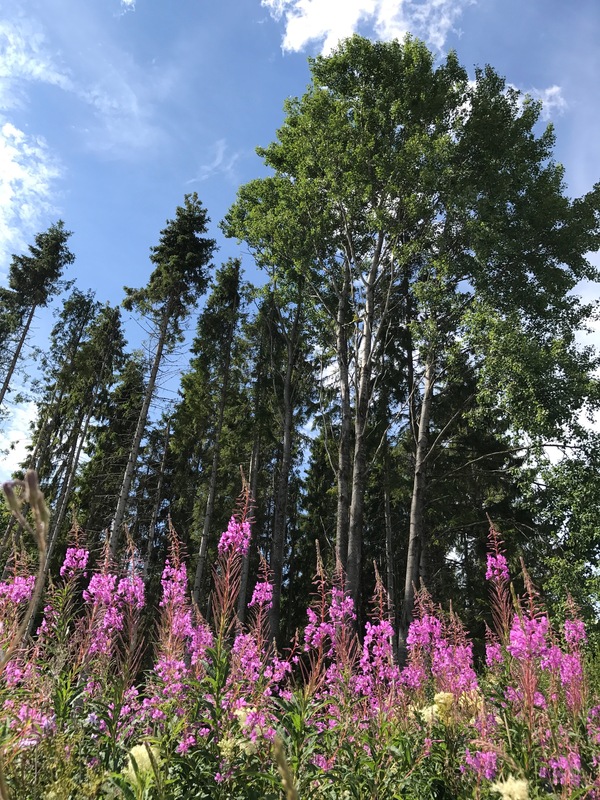 There were still some wildflowers even though I think it’s late in the season for them. 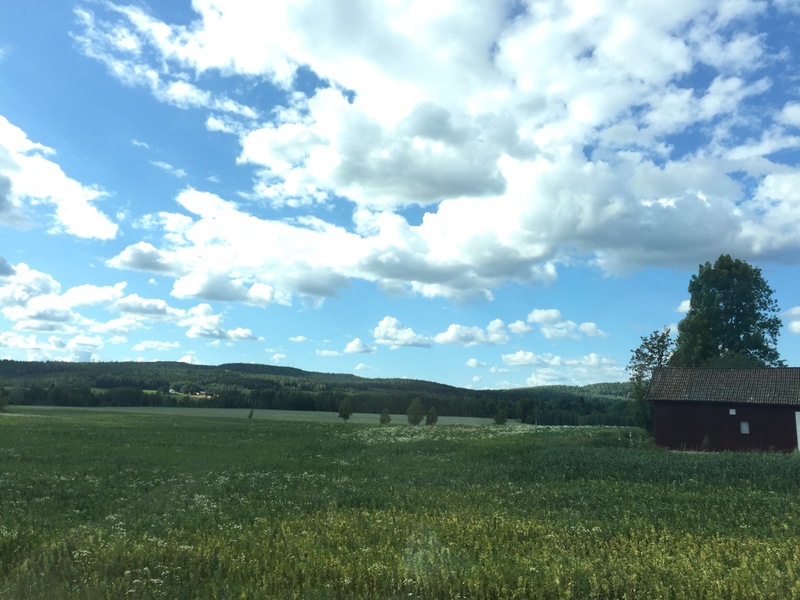 We are just starting to get used to the perma daylight of Sweden. The sun sets around 10:30pm and rises again around 4:00am. The first few nights this was challenging, and it seems the children next door are out bouncing on their squeaky trampoline until the last smidgeon of light is gone. 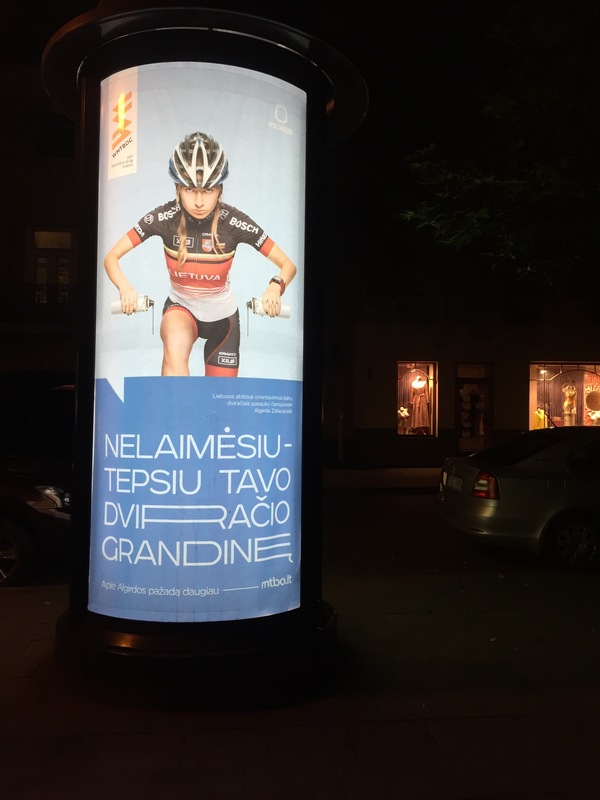 Now we are beginning to realize how helpful it is because we can ride home on our bikes way late into the evening with no need for lights! 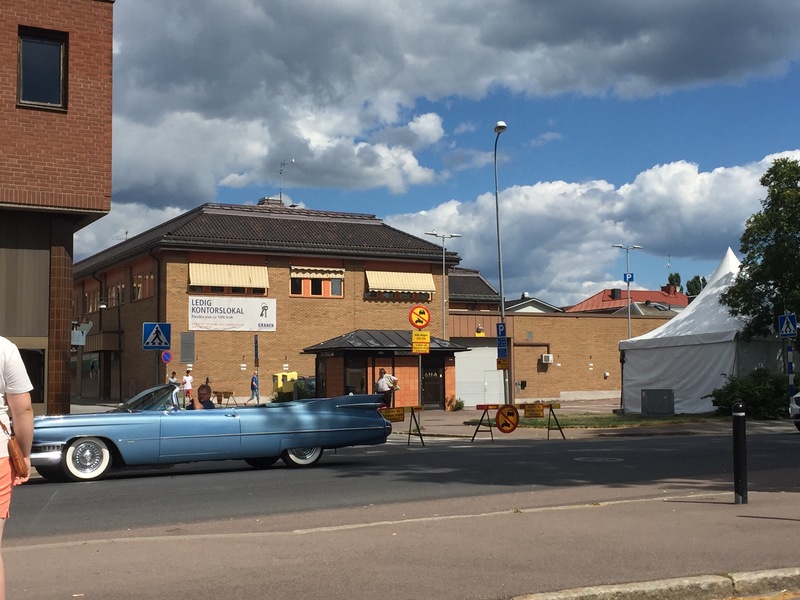 One thing we haven’t quite gotten used to is the large amount of classic American cars owned and driven by local folks from Arvika, and it seems they prefer convertibles. Our downstairs neighbor says all the car owners like to drive slowly through town when there’s an event going on. O-Ringen is the perfect opportunity! I haven’t snagged any good photos yet, but here’s something to give you the idea. I even saw one guy dressed in a leather jacket with hair slicked back like Elvis. So strange, and not something we were expecting to see at all. 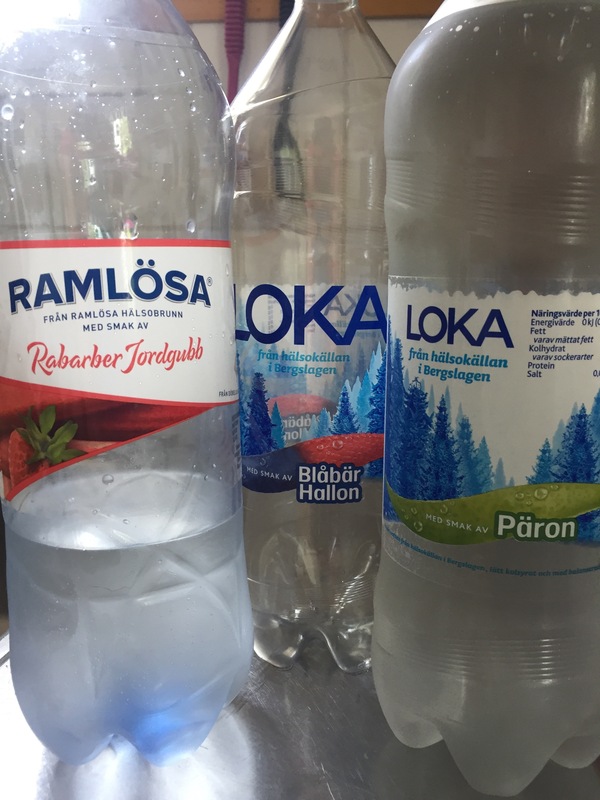 We have found so many delicious new flavors of sparkling water. 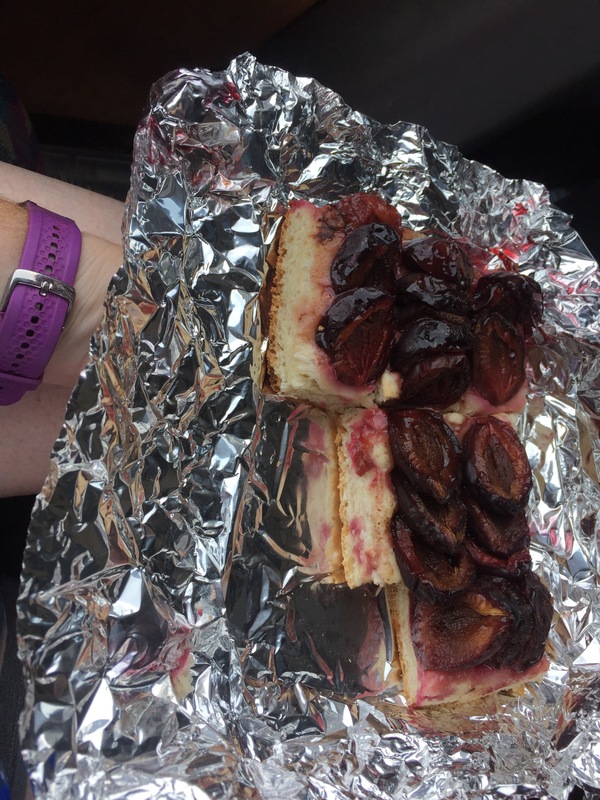 This is Strawberry Rhubarb, Blueberry _______________, and Pear. All delicious! 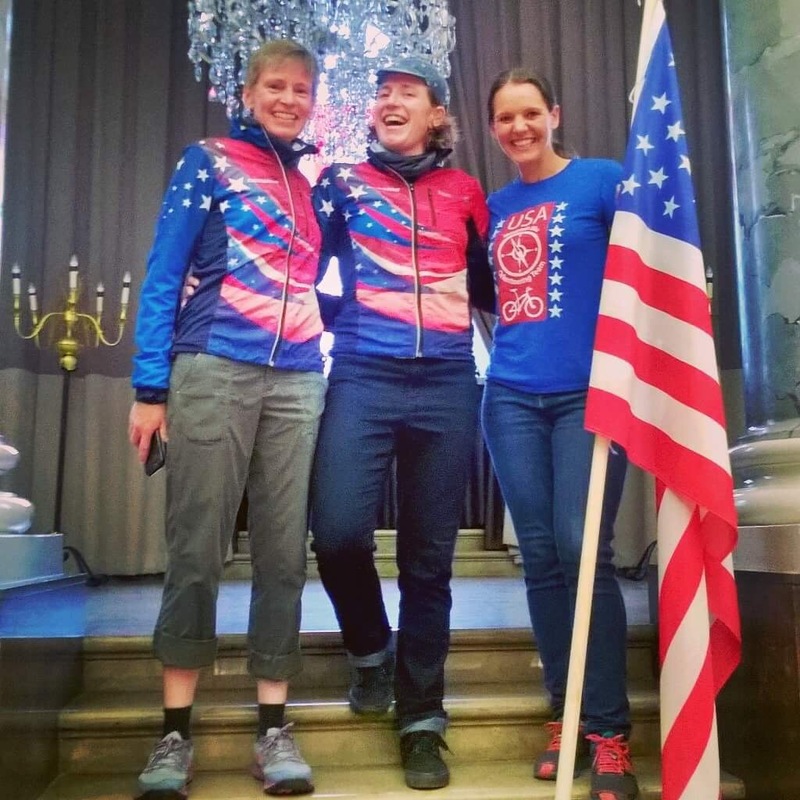 And lastly, we also ran into some other US orienteers! I spotted Tori’s Cascade Orienteering Club jersey out our window and we ran down to see who it was. Tori, Kevin, and Hannah are all participating in Foot-O. 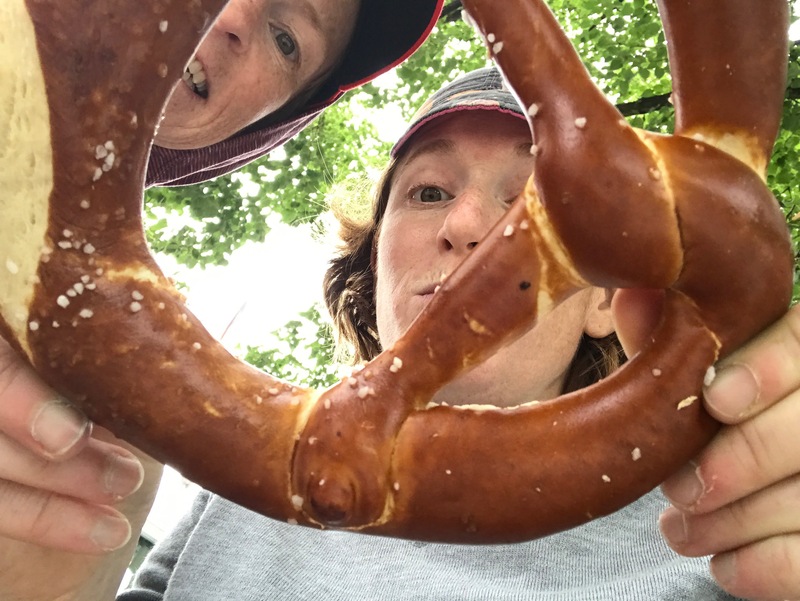 So fun to see people out of the blue amongst what is now 12,000+ O-Ringen participants!